I’m not a big fan of the FDA. Let’s make that clear right up front. I do respect their overall intentions, and believe they have done a lot of rarely recognized good. But there are some dark spots on the FDA X-Ray, to be sure. I am, however, a fan of reason and fairness – two traits that seem to be sorely lacking in the otherwise legitimate criticism of this federal agency. Specifically, the argument that the FDA is somehow censoring the ability of dietary supplement marketers to present truthful and accurate disease treatment claims, and that this is somehow a conspiracy to benefit the drug companies. The same drug companies that, allegedly, have the FDA in their hip pocket. It’s certainly fashionable to buy into such assertions at face value, and scandalous in itself to dare defend the FDA (to what degree that is true, I’m sure I’m about to discover). But dare we to actually apply some common sense and logic, that is, to really think about the issue rather than take the safe, easy, “government bad”, “drug company greedy” position, we may just come to a different conclusion. Most Baby Boomers will likely recall back in the 1960s, 70s, and arguably 80s, when such companies as Johnson & Johnson, Bayer, and Bristol-Myers were all members of the greatly admired and respected “Pharmaceutical Industry” that was working to improve our quality of life, and even save it. Curiously, and not coincidentally, when us boomers started to turn 40, and nutritional supplement sales began to skyrocket, Merck and Pfizer were now big, bad “drug” companies trying to squash legitimate health claims attributed to natural substances they couldn’t patent. Many of which were substances that had been on Earth for millions of years, but only after boomers turned 40 did they suddenly possess miraculous health and “anti-aging” benefits. We keep hearing that the drug companies are somehow in cahoots with the FDA. I’ve certainly seen some circumstantial evidence of this, such as their railroading and subsequent banning of Ephedra (certain ephedrine alkaloids, actually) that they pulled off a few years ago. This was in spite of its proven efficacy, and the absence of any evidence proving a cause and effect between the adverse effects reported and the usage of Ephedra products. But this is an example of a supposedly harmful supplement being taken off the market, and one could fairly argue it’s better to be safe than sorry. However, when it comes to the FDA’s heavy handed approach to our health benefit claims, I really don’t think they’re out of line. First of all, the FDA actually makes the lives of pharmaceutical companies quite miserable. If Merck or Pfizer want to make a disease treatment or prevention claim – the identical types of claims dietary supplement marketers (and many MLM reps) want to be allowed to make, and so many are making – the FDA demands that they spend tens-of-millions of dollars and 5-10 years going through three phases of testing. Phase one involves in-vitro (i.e. in a Petri dish or test tube) and animal testing. Phase two is where limited human testing is performed, and phase three typically involves several studies on thousands of people. And these studies utilize a “placebo”, an inert substance like a sugar pill or dummy device that actually does nothing, and are “double-blinded”, where neither the patient nor the physician are aware of which is which. What’s more, all of this study and analysis is done to just prove the efficacy of one medical claim. If the company claims their drug treats both osteoporosis and arthritis they have to go through all of this twice. This is all done to not just prove the drug works, but also, and equally, to prove it is not harmful. And yet, in spite of all this extensive testing, some drugs still end up harming people (like Vioxx). So, if the FDA is going to demand that the big pharmaceutical companies have to spend a decade and millions of dollars proving a single medical benefit claim, why should the dietary supplement industry be allowed to make several medicinal claims about a single product based on only personal testimonials and a few articles published in PubMed? We plead “freedom of speech” and “it’s our first amendment right” yet we are loath to allow the drug companies those same freedoms and rights. Consider that dietary supplement marketers often point to in-vitro or animal studies as the rationale for the rightful ability to make medicinal claims. So then, by the time a new drug has passed only the first phase of FDA mandated clinical trials they already have as much, if not significantly more “scientific substantiation” to back up their claim than dietary supplement marketers do about the vast majority of their products. Furthermore, a personal testimonial is essentially a non-placebo, non-blinded, non-medically supervised, non-controlled in any way, clinical trial involving one person. The “placebo effect”, where a patient reacts positively to even the fake pill or device, is powerful and common and must be eliminated as a possible reason for the positive effect. I followed two drugs through all phases of FDA mandated testing and both achieved a better than 50% remission rate, yet both failed phase three testing and were not granted new drug approval. Why? Because the placebo group had about the same remission rate! And these were not diseases where people subjectively rated their pain or mood. These were physiological conditions that improved by introducing nothing more than the idea the subject was being treated. So by the time a drug company has successfully completed even phase two clinical trials they usually have far more scientific evidence that their substance works, and is safe, than any dietary supplement ingredient. So again, why doesn’t Merck and Pfizer have the same “freedom of speech” at that point to sell their product to the public by making a disease treatment claim? Oh, but if the drug companies were to ever try and get such a medication on the market, with only this limited amount of testing, we’d all scream bloody murder. Right? If you’re going to make disease treatment claims you also have to prove (again, requiring years of double blind, placebo controlled studies on thousands of people) that your product is also safe. Note in many of the FDA’s Warning Letters to dietary supplement marketers they say their product is “not generally regarded as safe” (i.e. not on the GRAS list). That doesn’t mean it isn’t safe, it just means they haven’t went through all the hoops to prove it is. Obviously in some cases, such as the various exotic fruit juices that now pervade the MLM market, it would just be a formality – just as it was for many pharmaceuticals. But, the FDA demands that they still have to go through such a formality. Yes, there are many common substances that obviously have disease treatment or prevention benefits, and we know they do from literally hundreds of years of observation. For example, we’ve known since the 15th century that citrus fruits, or more specifically citric acid, prevents and cures scurvy. We also know by now that Oranges and Lemons are probably safe to consume. And please don’t respond with the “but their drugs are synthetic, our supplements are natural” argument. Arsenic and mercury are “natural” and virtually every drug ever produced can be traced back to a “natural” source (i.e. penicillin and fungus, Codeine and the Opium Poppy, Aspirin and White Willow Bark, etc.). So, do you want Merck and Pfizer to keep to the same “proof” regimen currently required by the FDA? If so, then why shouldn’t dietary supplement marketers have to as well? And in the case of the most obviously effective and safe substances that do have some scientific substantiation, although far less than required of drug companies, the FDA does, in fact, allow for the makers or marketers of such substances to petition for the right to make “Qualified Health Claims Subject to Enforcement Discretion”. That’s why we can make such claims related to green tea and selenium and certain forms of cancer, tomatoes and/or tomato sauce and prostate cancer, omega-3 fatty acids & coronary heart disease, chromium picolinate & diabetes, calcium and hypertension (high blood pressure), and several more. So, if you have a natural, non-patentable substance and you want the freedom to make medicinal claims about it, you don’t need to change the law. There is already the facility for supplement companies to accomplish this which does, indeed, require substantially less clinical testing than is demanded of drug companies. However, if you definitively claim your essential oil will prevent or treat Ebola, or your glucosamine supplement will cure arthritis, sans FDA permission to make a Qualified Health Claim, you are begging for an FDA penned Warning Letter. And righyfully so. If anyone, whether it be an MLM distributor or company, a chiropractor, a naturopath, an herbalist, or a pharmaceutical company, wants to make a claim that their product prevents, treats, or cures a disease, they should all be held to the same standard of proof – both of efficacy and of safety. So we have to decide which way we want to play this. Do we want everyone to be able to say a product cured his or her disease because they think it did, or because the company has a few hundred testimonials, or they did a “study” on 15 people? Fine. Then Merck and Pfizer get to put their drugs on the market under the same rules. That would seem to be the logical alternative to the way it is now, where the FDA requires an extensive, expensive, decade long testing process of anyone who desires to make a definitive (non-qualified) disease benefit claim about their product, pharmaceutical company or otherwise. We seem to want the ability to make definitive disease benefit claims based on a small fraction of the evidence that is required of drug companies, but are outraged at the prospect of drug companies afforded the same “freedom of speech”. We seem to want the advantage to be in our favor on both sides of the scale (efficacy and safety), while at the same time accusing the FDA of not playing fair with us. Well, at least in this case, I think they are. Len Clements has spent over 24 years researching and analyzing all aspects of MLM. He is a legally recognized expert in MLM, and a professional speaker, trainer, and corporate consultant. He is the author of the controversial book “Inside Network Marketing” as well as the audio presentation “Case Closed! The Whole Truth About Network Marketing”. For more information, visit http://www.InsideNM.com. The number of each type of adverse effect compared to the total number of Ephedra product users actually showed that most adverse effects, including death, occurred at a rate lower than would occur by random chance for the same size segment of the population. One was a medication for gram-negative sepsis, the other for Crohn’s Disease. A discussion of AVON’s departure from the Direct Selling Association. This presents a different take on this subject than is being presented by most other commentators. An objective review of Wake Up Now by a non-participant. … it’s what they defined as not being indicative of a pyramid scheme that is most interesting, and reason for celebration. Back in 1994 a couple of distributors filed a class action lawsuit against Omnitrition claiming they were an illegal pyramid scheme. Omnitrition won by summary judgement, meaning the court felt there was such little chance the plaintiff’s could prevail there was no need to waste the court’s time. The plaintiff’s appealed to the 9th Circuit Court and won. However, unlike how many MLM critics like to portray this victory, all it did was overturn the lower court’s summary judgement and send it back for trail – it did not find Omnitrition guilty of operating a pyramid scheme, evidenced by the fact that Omnitrition, now 20 years later, is still in business. There was eventually a private settlement, and thus there was never a trial. But here’s where it got sticky. In the 9th Circuit’s decision they didn’t simply declare the summary judgement overturned, they included what’s called dicta. That is, extra commentary. In this extraneous text it was declared that only those products retailed to non-participants in the income opportunity should be commissioned. That is, reps should not be considered “end user” customers, thus those products personally consumed by reps should not be commissioned. In spite of the fact that dicta is defined as “Opinions of a judge that do not embody the resolution or determination of the specific case before the court. Expressions in a court’s opinion that go beyond the facts before the court and therefore are individual views of the author of the opinion and not binding in subsequent cases as legal precedent”, MLM critics, and future plaintiffs in cases against MLM companies, absolutely adored this supposed “legal precedent” that “outlawed” paying commissions on distributor’s personally consumed product. It appears the 9th Circuit Court has changed their mind. Perhaps now the infamous language within 9th Circuit Court’s Webster v. Omnitrition decision that forbade commissioning products consumed by distributors can go where it should have gone a long, long time ago. Away. Unlike my previous Empower Network review, which was 51 pages and took almost six months, this one was only 37 pages and took about six weeks. One of the major differences is that Empower Network wouldn’t stop disclosing tons of internal data, and willingly allowed me to grill them for over six hours of interviews. Other than a couple of helpful links about their comp plan sent by their VP of Sales, Wake Up Now (WUN) has refused all requests to participate in my investigation. The last time this happened was back in 2002 when Prepaid Legal (now LegalShield) refused to assist me in my efforts to get my facts straight. After I published the review I received a letter from their attorney suggesting that I should “get my facts straight”. I asked for a list of specific facts I didn’t get straight, which I would have gladly gotten straight. Not only did I never hear from them again, over the next six months most of the aspects I criticized were corrected or improved. I said after my Empower Network review that is was the last one I was going to write, for free. EN received literally several thousand dollars worth of compliance consulting as a result of that review, at no charge. Since then I’ve been hired by companies who’ve asked that I turn my magnifying glass on them, but the WUN review was the first where a company, or in this case a group of companies, hired me to do a review of a competitor. I informed them that there was no guarantee the review would be negative, and that I would not deliberately slant it that way. I was instructed to “call it like you see it”. And that’s exactly what I did. Since the review did end up being generally negative I’ve been accused for being a “hired gun”, and manufacturing a negative review just to suit the agenda of my clients. However, no one has yet to offer a rebuttal to any negative point I made in the review. In fact, WUN supporters have tried their best to divert attention away from the facts, opinions and conclusions I presented, and instead have focused on who the companies are that hired me, and how my same criticisms may apply to them. My response is, what if my clients were Fortune HiTech Marketing, BurnLounge, and Zeek Rewards? While that may certainly be ironic, how does it in any way diminish the veracity of my actual review? Either my criticisms of WUN are accurate and well reasoned, or they are not. If you feel I did get anything wrong, please specify in the comments section below the article. Perhaps I’m just rationalizing, but I look at it this way: Attorney’s are hired to write negative reports, called Complaints, all the time. And they, in fact, are hired to deliberately make their reports as negative as possible. Or, as positive as possible if they’re hired by the defendant – even if they don’t personally believe what they are writing. And no one cares, no should they. A prosecuting, or plaintiff’s, attorney is legally, ethically and professionally obligated to aggressively present their case against someone in the most negative, damaging way that is appropriate for the circumstances. That’s their job. I, on the other hand, was hired to make a case for what ever it was that I found, good or bad, nothing more, nothing less. Even if the review was glowingly positive, I still get paid. That’s why, if I were inclined to deliberately fudge the review one way or the other, it was actually to my advantage to make it positive. I still get my fee, and gain tons of credibility. My fear is that my WUN review made no one happy. Although I did cite some serious financial and legal concerns, it still may not be negative enough to make those who funded the review happy, but was surely negative enough to make WUN unhappy. So I might have just made everyone unhappy. Oh well. I called it like I saw it. Check out this great new program sponsored by the MLMIA and co-hosted by Peter Mingles and MLMIA founder Doris Wood. On each one hour show a regular panel of industry authorities (including myself) discuss and debate various hot topics related to our industry. The show is live on the first, third, and fifth (if there is one) Monday of each month, and airs at 7:00 pm PST, 10:00 pm EST. The next show will be June 16th. Last Monday’s show focused on the “independent contractor” issue, and the question of how much control should a company have over an independent distributor’s business? Please check it out, and tell your friends. Thanks. Is Herbalife Under “FBI Criminal Investigation”? That, and a lot of other bovine poop circulating throughout cyberspace and the media, is one of the two major topics on edition #26 of the Inside Network Marketing podcast. Is Vemma Still Not MLM? Randy, Cathy and I (mostly I), make our final points regarding Vemma’s alleged departure from MLM and more towards “affiliate marketing”. We (mostly me) also deconstruct my recent interview with Vemma Founder and CEO B.K. Boreyko. And seriously, it will be the last word on the subject. Everything that needs to be said has been said. Barry Minkow: Where is he Now? Those of you who were around way back in 2007-08 (in MLM years, that’s a long time ago) will probably remember Barry Minkow. He was the guy who blazed the trail for unethical short sellers like Bill Ackman to bash public MLM companies so as to profit from the resulting drop in their stock price. Barry tried this on USANA, Medifast, Pre-Paid Legal (now the privately held Legal Shield) and, yes, Herbalife. When he tried the same extortion scheme on Lennar (the second largest home builder in the U.S.) he was found guilty of stock fraud and sent back to prison – for the second time (he also perpetrated a massive stock fraud back in the 80s). So where is he now? Back in prison – for the third time. The Inside Network Marketing show includes an recurring segment called “The Kitchen”. As in, if you can’t stand the heat, stay out of. Past Kitchen guests include Randy Gage, Kevin Lehmann, and Empower Network co-founder Dave Wood. I started doing this segment after listing to so many “hard hitting, no hold barred” interviews of various MLM personalities where the interviewer did little more than toss softballs and blow love kisses. For the record, I like BK, a lot. He’s a good guy, and I’ve always been a fan of his companies (full disclosure: I consulted on the original New Vision compensation plan). And he’s always been a fan of the MLM space. He claims he still is – even though he seems to be going to great lengths to now distance himself from it. I’m not going to spell out my, and others, concerns and objections here, as they are clearly stated in the interview. However, based on the rampant and perpetual mischaracterizations of them elsewhere (e.g. Mel Atwood’s desperate attempt to voice many of the concerns we share on Facebook, which I reference during the interview). I will emphasize again that this has nothing whatsoever to do with semantics, or simply what BK wishes to call his company. It’s much deeper than that. BK’s claim that Vemma is no longer a multilevel marketing company because their business model is now “more like affiliate marketing”, and “less like Amway, more like Amazon”, is not a matter of subjective opinion. Very clear definitions, both legal and advisory, apply to what defines an MLM operation. As long as Vemma is still using the same binary compensation plan they’ve always used – which they are – their business model will still involve multiple levels of people marketing. Those aspects that BK is claiming causes Vemma to depart from the MLM model are, for the most part, not particularly unique to MLM. For example, while it is true that the majority of MLMs charge retail customers more than reps, there are several that don’t (e.g. Melaleuca and USANA). Nor is having no sign up fee. Yes, the large majority of MLMs do require such, but one could argue (and I could easily be the one), that this is a good thing. I’ve heard it claimed recently that franchises have a “97% success rate” (it’s closer to 65%**, but either way, it’s higher than non-franchises), and that MLM, with all of it’s advantages, should have just as high a rate. Except there’s one glaring difference. When people invest $1.5 million into a Taco Bell franchise they have a huge incentive to work hard, and for as long as it takes to get to profitability. When someone risks nothing they have practically no incentive to do anything. It’s actually healthy for an MLM to have at least some barrier to entry. Forgoing a $25 distributor kit fee in lieu of a free enrollment only gains you one class of participant – those that would not have joined if the cost to start their business was $25, but will if it’s free. In other words, even more people getting into your business that have no business getting into business (of any kind). Vemma now also claims that now “everyone must first join as a customer”, and you can upgrade to a distributor (which Vemma now calls Affiliates) by either enrolling another customer or buying the $499 Affiliate pack. However, you can buy the Affiliate pack and become an Affiliate right after you went through the online enrollment process. So, technically, I guess it’s true. Most who now join Vemma as an Affiliate will be, at least for a few seconds, a customer. My strongest concern is that now, when the industy is under attack based on a false premise (and if you think this is just an Herbalife issue, you’re so very wrong), and when we need the strongest, most admirable and respected representatives of the space to stand up and help us defend it, one decides to cloak its true identity to avoid the negative stigma that these high profile attacks have created, and are creating – all in the name of “greater transparency”. It’s only room temperature in The Kitchen for about the first 15 minutes. The heat does rise over the last 45. These MLM denier companies, like Melaleuca, Mary Kay, and now, unfortunately, Vemma, are all bound to MLM by an unseverable chain. If this ship we call multilevel marketing ever sinks, they’re going to the bottom right along with it. And we do seem to be taking on a little water. I would strongly suggest that rather than trying to saw through the chain, they might want to grab a bucket. * Although Tom Chenault at least tried to push back a little on his show, but was limited by time. ** Source: Bureau of Labor Statistics. Oscars, Emmys, Tonys… and Tammys! I know it’s been a while since my last Alert, but I can now reveal the second major project that has kept me busy (the other being my Empower Network encyclopedia). I’m sure you are aware of the various “Best of” polls that are promoted around the industry, which really reveal little more than which distributor group can best promote the poll. There are certainly a number of more reputable and prestigious awards distributed annually, but they are limited either to those who are members of the awarder’s organization, clients of their firm, or a resident of a certain city or state (or, in some cases, to only those willing to attend the awards ceremony). Even among those very few exceptions the awards are selected by an elite panel of internal judges, not an academy of industry leaders, authorities and experienced veterans. That’s why I founded The Academy of Multilevel Marketing. TAMM currently has over 100 voting members who will participate in the nomination, and ultimate awarding, of what I’m sure will inevitably be called “Tammys”. Over 40% of Academy members are industry authorities who have no direct MLM company affiliations, and the others are respected leaders who have pledged, and we trust, will be objective and fair in their voting. Of course, the larger and more diversified the voting pool the more accurate – and credible – the results (per the “The Wisdom of Crowds” concept). So if you would like to nominate other knowledgeable, objective leaders to be an Academy member, or volunteer your own services, please do so by applying HERE. However, no more than 3% of all Academy members can have a direct affiliation with the same company, so we will need to know what affiliations, if any, that you have. This information, and your Academy membership, will be strictly confidential. Members will be provided a professionally produced graphic image to display online that distinguishes them as an Academy member, but members are under no obligation to use it. We have also formed a TAMM Board of Directors who have helped to developed this concept, and who will oversee, audit and certify the nomination and voting process. They are (alphabetically): Mel Atwood, Len Clements, Kevin Grimes, Dr. Charles King, Bret Matheny, Michele McDonough, Kevin Thompson, Lisa Wilber, and Doris Wood. TAMM has already raised over $10,000 in sponsorships from various industry company’s vendors and individual leaders, so our awards will be world class, with each category nominee receiving a beautiful, engraved plaque, and winners receiving an all Chrystal trophy like the one in our logo. You’ll see a lot of diamond shapes in our imagery and awards, which represented the true shape of an MLM organization.Sponsors will be acknowledged at all TAMM events and will be prominently recognized on the TAMM website. If you are interested in sponsoring TAMM please let us know. Credibility based on value and merit – not who drives the most traffic to a particular website, offers the most valuable reciprocation, or is simply the hottest or fastest growing. Please visit the TAMM website at http://www.AcademyOfMLM.com. 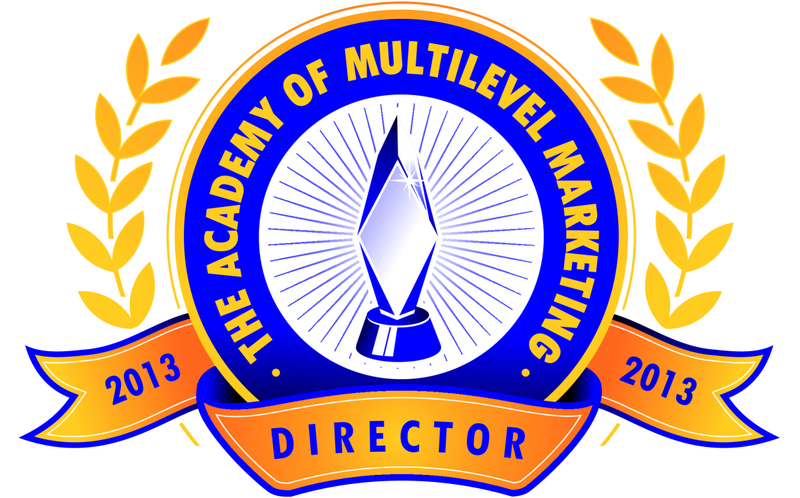 If you would like more information about The Academy of Multilevel Marketing please eMail me at MLMAcademy@cox.net. Speaking of those “best of” polls that are for “entertainment purposes only”, the vote for 2013 is nearing an end, so get in there and support your company! This is a free webinar produced by my friend Zazz Daniel which I will also be participating in. Zazz and I have a very different philosophy when it comes to M.L.M. training than most. For one thing (out of many), we tend to place a little more emphasize on ethics and integrity. For example, we’ll never advise you to call your college roommate after 20 years and pretend like you suddenly became interested in how they are doing, or troll the online job seeker sites to bait and switch them onto attending an opportunity presentation. Also, Zazz is one of the very few trainers I know who understands that hype not only doesn’t work, but a truthful, evenanti-hype approach to prospecting works best! The webinar will be held this Thursday, December 19th, at 11:00 am PST (2:00 pm EST). Check out this personal video invitation from Zazz HERE. To learn more about this webinar, and to enroll, visit http://ZazzDaniel.com/webinar. Please support this training. If enough leaders embrace these concepts and philosophies we can actually turn the hypie, utterly inaccurate but common claim that “M.L.M. is gaining respect and credibility” into anactual fact. This review started out to be like most others I have done. That is, a couple of weeks of research and 10-15 pages of writing. It didn’t end that way. About six months of research and 51 pages of writing later I can honestly say this was one of the most fascinating company reviews I have ever undertaken. EN is controversial and has been the subject of a lot of criticism, and for the most part, for good reason. This review did turn more towards the positive the deeper I dug (I usually find more dirt) but didn’t quite make it all the way to the green side of the meter. But call them what you will, just don’t call them evasive. Their willingness to provide me with even the most intimate financial details of their operation was astounding, and The Davids (co-founders Wood and Sharpe) have no skeletons in their closet. Not that they don’t have skeletons. They’re just not in their closet. In fact, they pretty much drag them right out on stage with them at every live event or video they produce (especially Sharpe). And if you think I’m verbose (I prefer prolific) due to my numerous tangents and tendency to over-explain, wait until you hear the interview. Dave Wood makes me seem pithy. The result of all this is a 51 page review, but one that early feedback suggests is a surprisingly easy and interesting read, even for those not particularly interested in Empower Network itself. I hope you agree. It’s also the last such review I will ever write. At least for free. Frankly, I’m tired of providing at no cost what M.L.M. companies are paying compliance, marketing, and compensation plan consultants thousands of dollars for. I’ve done enough of these reviews to demonstrate the level of fairness, accuracy, and research I employ, and if anyone wants their M.L.M. program subjected to this level of analysis and scrutiny by all means, let me know. But this will be the last such review I will publicly provide, at least in writing. This Empower Network review was the primary reason you have not seen a single video blog, podcast, or Alert coming from MarketWave in over five months. It’s just too time consuming, and I’ve got too much else to say. So do expect to see a lot more activity here at “Inside Network Marketing” in the weeks ahead. The subject of Part 7 of my Inside Network Marketing video blog series deals with the claims that are often made by M.L.M. companies which are usually technically true, but not always entirely true. This analysis of corporate hype includes a series of real world examples and offers a number of ways to detect such deceptions and how to get to the truth. There are also two case studies at the end related to a couple of companies that claim to be experiencing massive growth. Are they? You decide. I’ve found that when I record video blogs entries I seem to enter some alternate universe where for every minute I think I’m speaking three minutes actually pass. This segment is 31 minutes long, but I swear it felt like 10 minutes when I recorded it. But hey, that’s the beauty of recorded video and audio blogs. You can always stop it and come back to listen to the rest later. For the record, all this applies to a minority of M.L.M. companies – but still way too many. The first edition of the new INM podcast reboot is a little rough. I’m not pleased with the sound quality (I’ll fix that before the next one, I promise), and I’d like my new co-host, Cathy, to show off her intellect and sense of humor a little more. I asked her to allow me to do most of the talking and she mistakenly did as I asked (the irony of that will be clear when you listen to the show). The topic was M.L.M. products. Not so much about product claims, but more from the standpoint of how goofy and absurd a lot of what we offer, as an industry, can be. We (mostly I) rip on Amega’s magic wand, of course, but also products like canned air, sour milk perfume, soap formulated by God, and what will likely the the most controversial… homeopathy. Flame mail can be sent to InsideNM@cox.net. Disclosure: The time and expense involved with researching, analyzing and producing this review of Wake Up Now was funded, in part, by several competing network marketing companies. However, my reviews are never written to serve any other agenda than to portray the review subject in the most honest, accurate, objective and fairest manner. The companies which contributed funds towards the production of this review have been made fully aware of this, and I have been instructed to “call it like you see it.” And that is precisely what I shall do. Disclaimer: The opinions, beliefs, observations and conclusions expressed in this review are solely my own and do not necessarily represent those of any other third party. I am not an attorney or regulatory agent of the government and thus cannot make definitive legal conclusions, nor should anything within this review be considered legal advice. All information within this review is based on research and analysis conducted between April 20 and May 27, 2014, with minimal participation by the subject, and is presented to the best of my knowledge at this time. I do not own, nor have I ever owned, stock in Wake Up Now and have no expectation of investing in Wake Up Now in the future. I’m prejudiced. I admit it. When ever I begin the review of any MLM company I tend to go into that process with some sort of pre-conceived idea of how the review will go. I pre-judge (the literal meaning of prejudice). Usually I anticipate the review being, to some degree, negative. Not because I’m cynical – oh, I am, but not because of that – but rather, most of my review subjects are by popular demand, and usually because the subject is controversial, or there is already a lot of suspicion about its ethics and/or legality, and people just want to know the truth, based on facts. That’s why I’ve most recently reviewed companies like Zeek Rewards1 and Empower Network2. In the case of Wake Up Now (WUN), I confess to a high degree of ambivalence. On one hand I saw the very disproportionate amount of online rhetoric criticizing WUN and, at first blush, what appeared to be yet another “online mall” program (a category of MLM that has historically produced virtually a 100% failure rate). But on the other hand, I thought, imagine how much credibility I would gain by actually writing an overall positive review, in spite of the fact I was being paid, even in part3, by a group of competitors. I am by no means suggesting I ever intended to deliberately do so. I am as loathe to fudge the facts towards the positive as I am the negative. But I certainly intended to give them every benefit of the doubt, and allow them every opportunity to fully address any and all concerns I might have. So I admit it. I actually went into this review of Wake Up Now hoping it would be positive. I don’t think I got my wish. To be clear, I’m reviewing Wake Up Now, Inc., the Utahbased corporation. WUN’s management team has completely changed over since its inception. Of the ten senior managers they listed online in September of 20105, seven were gone by the time current CEO Kirby Cochran came on board in August of 20116 and the changeover was completed by the end of 2013. As I understand it, the corporate overhaul was not entirely amicable. Originally, WUN’s senior management was identified by titles such as “Crocodile Overseeing Vision“ (COV) and “Crocodile Steward of Growth” (CSG). I like it when MLM executives don’t take themselves too seriously and try to have a little fun. The croc theme was inspired by Crocodiles International, which describes itself as a “Personal and Organizational Culture Development Training and Coaching company.” More traditional titles were adopted around mid-2011. The current management lineup has Kirby D. Cochran7 (60) at CEO, Jason M. Elrod8 (34) at President, and Phil J. Polich9 (65) at COO (presumably Chief Operating Officer, rather than Crocodile Overseeing Operations). All three gentlemen have substantial business experience, however, none of it appears to have been within the MLM space. They did wisely hire attorney Kevin Thompson and consultant Troy Dooly to assist in developing compliance policy, but not until late last year. They also hired the MLM law firm Grimes & Reese early on. Having said that, their current business venture is also not doing well, at least financially. We know this because, in spite of the large majority of public MLM companies now trying, or preparing, or desperately wanting, to go private – and for good reason – WUN chose to go against the trend and become publicly traded. As a result, they must now consider what’s in the best interest of their shareholders, which is not always consistent with the best interest of their distributors, and they must open their books for all to see. This works great when you’re in momentum (just ask ViSalus), but when things turn ugly, you can’t wear makeup (just ask ViSalus). With sales of over $18 million, WUN has somehow managed to lose over $10 million – and the losses are rising. Even with a quadrupling of revenue from 2012 to 2013, net loses increased by 37.7%. This is especially unusual considering the bulk of their product line is virtual and based on high-margin membership fees. The other products they resell should, for no other reason than basic economies of scale, have greater margins, thus greater profits, as sales increase. Yet, in 2013 their “Cost of Sales” was $11,167,523, or 91.7% of sales. Current WUN management has said there were some “bumps” and “hiccups” early on and WUN proponents have suggested the previous management “blew through the money.” However, WUN was under new management in August of 2011, and even if we apply all 2011 losses to the previous management, it still amounts to $2,365,528 (77.0% of sales) over three years, and losses of $7,851,362 (51.7% of sales) in the two years since. WUN has defended this exsanguination14 of cash by asserting funds are being plowed back into the business to expand their infrastructure in preparation for future, massive growth. However, their 2013 financial statement betrays this explanation. Although sales increased from 2011 to 2012 by $1.87 million, and losses increased by $1.37 million, their fixed assets only increased by $392,676 (total assets increased by $205,261 due to all other forms of assets declining). From 2012 to 2013, sales increased by $9.17 million, and net losses increased by $1.25 million, but fixed assets increased by only $236,247 (the majority went to software development). Total assets did more than triple to $2.1 million, but the rest of this was attributed to increases in cash, accounts receivables and loans, inventory ($128,998, most of which would be their skin care products), and prepaid expenses (e.g. advance payments on insurance that hasn’t been completely used up yet). Also, their total liabilities increased from 2012 to 2013 by $3.57 million to $6.74 million. WUN is expanding, I have no doubt. I’ve seen the videos of the construction being performed to expand their office space, and according to industry advocate, and WUN consultant, Troy Dooly, they went from 30 employees in October of 2013 to over 200 today, and their tech team has expanded from 2 to 20.15 I’m not questioning that some of this huge, growing debt and net losses are due to expansion expenses. But, it really does look like they are borrowing like crazy, raising additional capital via their stock, and successfully increasing sales – which then goes straight through WUN like poop through a pigeon (which is faster than a goose – look it up). WUN is also expanding internationally, but even this is being performed oddly. As of April 2014, they opened Malaysia and Thailand, which I get. Most of the Pacific Rim is an MLM hotbed. But they also announced “We will be open in Peru, Colombia, Brazil, Chile by convention (September 2014).”16 Regulatory, logistical and market challenges make Peru, Colombia and Chile strange bedfellows. Even Brazil can be challenging (trust me, I know) in that, like all South American countries, there is little regulation of MLM; pyramid schemes are rampant, and bribe– I mean, administration fees can be excessive. On the plus side, Brazil does have the market size, and they’re MLM crazy there, too. And they’ve got Rio. Although WUN broke out “Distributor Compensation” in their 2009 and 2010 annual financial disclosures (43.2% and 60% of sales respectively), they lumped this expense into “Sales and Marketing” in the three years following. If we consider the entire Cost of Sales (which can’t all be commissions considering this number exceeded sales in 2011) their payout must be significantly less than 71.5% and 91.7% in 2012 and 2013. Even if they are paying out anything close to these amounts, this compensation model clearly isn’t working. In late 2013, CEO Kirby Cochran stated WUN’s profit margin was about 20%. Based on their most recent financials, it’s closer to 8%. Based on the growing pains WUN has weathered over the past year, and their claims of expansion, the last thing they need to do is cut overhead. So, when you’re losing millions of dollars a year, and you’re operating at an 8% margin with the majority of your expenses being commissions, it seems obvious where WUN is going to have to cut to achieve profitability. The WUN website contains several typos and grammatical or punctuation errors. For example, the subtitle of the “On Demand” section of the Product Suites page, where one may select a few products a la carte, reads, “Get even more value with these something here for placement only and one more thing.” That’s verbatim. Their address on their home page displays a four-digit zip code, and all of the “View Details” links related to their energy products returned a “Page Not Found” error for at least the first four weeks I worked on this review (they’re working now). Their online notice was, “We are currently out of stock, BUT we.” That’s not a typo. Well, at least not mine. This has also since been repaired, but with an even more ominous message. Now the back order notice says “Pre-order now, receive volume credit for this month, and get your Thunder shipped next month.” I have also learned from a reliable inside source that, “WUN sold out of the first run (of Thunder) before it was ready to ship”. That means they must now be, and were, charging credit cards, paying commissions on these charges, then shipping the product weeks later. Not only is this a serious violation of most merchant services agreements (most banks demand product be shipped within 48 hours of the charge), but it creates the impression – and this is only speculation on my part – that they are floating the cash. That is, they need the funds from these pre-orders to fund the next run of the product. Otherwise, why haven’t they fired up the production line weeks ago, back when they saw inventories quickly diminishing? Maybe there’s a reasonable explanation. I don’t know. I wasn’t allowed to ask for one. If so, they’ve got a lot of work to do. Wake Up Now offers one of the most eclectic, hodge-podge of products I have ever seen. From a mobile app to help you track taxable expenses, to discounts on travel and groceries, to jewelry and to energy drinks. Want to learn a new language? They’ve got a course for that. Magazine subscriptions? Got it. Or, how about a commissionable web portal where you can send others to shop from over 5,800 affiliate vendors, and whet your beak a bit on every sale? Yeah, they have that, too. Let’s start with Awaken Natural Energy, which comes in both liquid (called Thunder) and powder forms (called Tropical Burst and Citrus Rush), and was introduced in March of 2014. Energy drinks were all the rage a few years ago in MLM as they washed over the industry on the same tsunami of “exotic functional beverages” that popularized Noni, Mangosteen, Goji and Acai, along with myriad other fruits, berries, roots, beans, fungi, phytoplankton and asteroid spores (and no, I’m not kidding) that pervaded the industry. While the Jungle Juice craze continues to slide down the other side of the STP coated bell curve, energy drink sales are still rising17. And as Americans become more and more overworked – that’s both Mom and Dad now (us Boomers can remember a day when only one had to have only one job to support a family of five) – and as us Boomers get older, and slower, there’s no reason to believe physical energy will not continue to be a coveted commodity. I consider myself somewhat of a connoisseur of energy drinks. There’s a guy who delivers my drink of choice, called GoFast (non-MLM), to all the grocery and convenience stores in East Las Vegas. My home is on his route. And no, I’m still not joking. Being physically addicted to them, much like a cigarette smoker is to tobacco, or more accurately, a coffee drinker is to caffeine, I have done a lot of research on this particular type of product in an effort to find the safest, or at least the least harmful, formulation. What I found is that most energy drinks, such as Red Bull, RockStar and Monster, the top three selling brands, contain numerous plant extracts, synthetic vitamins, and amino-acids, along with the obligatory caffeine, sodium, and of course, sugar (often listed as Glucos). Caffeine amounts range from 80 to as high as 500 mg. And that’s just what’s listed as “caffeine” on the can. 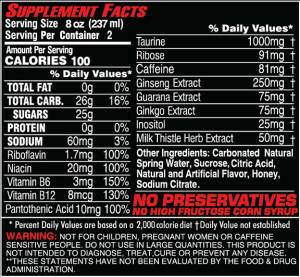 Then there’s the Guaranå, Ginseng and Green Tea, all of which add more “naturally occurring” caffeine. What also gives several top selling brands their kick are amino acids such as Taurine, L-Tyrodine, and L-Phenylalaline. Such ingredients are not cheap, thus neither are energy drinks. And then there’s the B-vitamins, all of which (mostly B-6 and B-12) are necessary to convert the food we consume into energy. WUN claims they do not consider other MLM energy drinks as their competitors, but rather the top selling brands in stores. They also like to brag about their $2.00 per 8.4 oz. can price (when purchased in 24 packs) as being among the cheapest on the market. Considering most bands are between $1.75 and $2.25, Awaken’s price is comparable. However, there is a reason for that – it’s among the cheapest formulations. Most energy drinks contain mega-doses of various B-vitamins, from 100% to 8,333% of the Recommended Daily Allowance (RDA) per the FDA, with the majority hovering between 100-250%. Awaken contains 100% of B-5, B-6, and B-12. It’s also on the very low end of caffeine at 80mg. The range among its top selling competitors is 80-200mg. And the only other energy producing ingredient found in Awaken is a modest 50mg of Green Tea, which just adds a little more caffeine. In fact, the only other primary ingredient of any kind is a small 25mg of Chokeberry Extract (which they recently, as wisely, renamed Aronia Berry), which is curious considering I can find nothing attributing the Chokeberry to physical energy production. WUN brags about Awaken having only 10 calories per 8.4 oz. can. Most energy drink brands have low calorie versions, such as Red Bull (13), RockStar (10), Monster (10), XS (8), and even Go Fast (10). In fact, Red Bull now has a “zero calorie” product. What’s also curious is that Thunder lists their 125mg of Sodium (salt) as being 1% of the “Daily Value” (DV), or the amount you should consume in a day. Sodium is the one ingredient you want to have the least of. However, Red Bull and Monster lists their 100mg (25 mg. lower than Awaken) as being 4% DV (four times higher), RockStar’s 40mg is 2%, and my beloved GoFast lists their 60mg of sodium as being 3% of DV. What’s more, several MLM energy drinks contained 5% to as little as none. But it’s not really the high levels of sodium in Thunder that concern me (125mg is not harmful), it’s their claim that this is a mere 1% of what should be your total daily intake. This may seem like I’m picking nits here, but consider this: A consensus of health organizations, including the FDA, peg the maximum daily recommended amount of sodium to be 2,300mg. So Red Bull, Monster, RockStar and GoFast got it about right. But 125mg is not 1% of 2,300mg, it’s 5.4%. 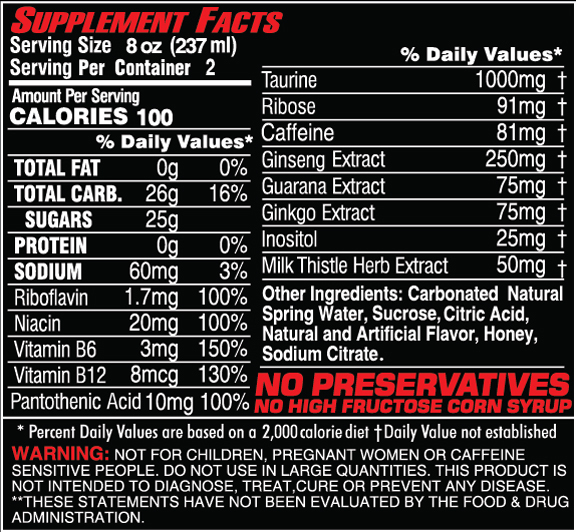 If they are off by over five times on the DV of this ingredient, how reliable is the rest of the supplement label? WUN also recently added a coffee product called Arabica Black, which contains Ganoderma. It costs $19.95 (8 CV), but there is no mention anywhere as to the size, or number of servings, even when I clicked on “View Details” (which actually worked). I literally had to find an image of the box and zoom in on it to discover it’s 30 servings. WUN also offers a line of personal care products that were acquired from the now defunct Trivani. Trivani was a somewhat controversial MLM company co-founded by Dee Mower, ex-wife of Neways and Sisel founder Tom Mower. Trivani was acquired by Ariix in August of 2011, and WUN introduced their new Trivani product line in September of 2013. I’m not entirely clear on how these products made it from Ariix, which is still in business, to WUN. A non-MLM company called Northstar actually has the rights to the line and now has an exclusive agreement with WUN, which now claims that “These are products that have been formulated specifically for WUN.”22 If WUN was going to have their personal care products custom-formulated just for them, why acquire an existing line of products? If these are the same Trivani products, and you want to let people know – because the market believes Trivani has great products – no problem. But, if they have since been reformulated, and these new formulations are exclusive to WUN, then they are no longer Trivani products, yes? They may be even better products now, I understand. But from a marketing standpoint, why brand your products with the name of a dead MLM company, which a previous MLM company has dumped, and whose formulations no longer apply? Alas, such questions will have to remain rhetorical. WUN also adopted Trivani’s “harmful ingredients” campaign which is, for the most part, nothing more than bogus scare tactics.23 To be clear, the marketing of these products are my only issue. Trivani’s products (at least the ones before they were reformulated specifically for WUN) were of good quality. Another primary product in the line is their “Vacation Club,” which has dropped from a one-time activation fee of $200 to what is now $90. On the up side, there are some good deals here (I did check and compare). On the down side, WUN’s Vacation Club is significantly higher-priced compared to travel club sites like Jetsetter.com, Vacationist.com, and several others, which offer the same “insider deals” and discounts on cruises, hotels, resorts and condos. Most online travel clubs are free (or under $90). What’s more, the WakeUpNow “booking portal,” for hotels and cruises, links to RezServer.com, a public site that posted identical prices whether I accessed it through WUN or went straight to it. There’s also a car rental discount page, which offers the same discounts as countless other online car rental discount sites. Taxbot is another showcase product, which WUN defines as “one-touch tax relief designed to make it EASY to save thousands on your taxes. The mobile app and online system help save you time, effort, and money. With Taxbot, you can track business mileage automatically with GPS and store receipts quickly by simply taking a picture with your phone.” And that’s accurate. This product was developed by Sandy Botkin, one of the foremost experts in business tax savings. However (you can usually tell how positive or negative one of my reviews are by the number of times I use the word “however”), Taxbot is usuallysold at Taxbot.com for $19.99 a month; however, TaxBot has a current sales promotion for $9.99 per month. It’s sold through WUN for $19.99 a month.Other organizations also have lower priced options24.Some MLM companies offer TaxBot to their distributor base but generally as a business tool25. Side note: A WUN webinar I watched suggests you use the Taxbot system to keep track of all your deductions during your luxury vacation.26 As Taxbot developer Sandy Botkin would surely agree – don’t do that. You can only deduct business expenses. Then there’s WUNProtect, “powered by Invisus.” However, it’s not just powered by Invisus, it is Invisus. Same product, for the same $34.95 price you would receive if you just went to Invisus.com. Same with WUNSpeak, their language training. It used to be powered by TellMeMore, for a one-time fee of $148.85 ($225 with a 35% discount available to anyone). Although their enrollment instruction videos (which are otherwise pretty cool) still list TellMeMore, this product is now powered by Transparent Language, for $29.95 per month, or an annual fee of $199.95. I don’t see anything substantially superior to TellMeMore, but let’s assume you are getting what you pay for. You’ll pay the same thing whether you pay WUN first to get to their site, or just go right to their site. The Marketplace also includes “WUNDealStream,” which is made up of an odd collection of only 22 very specific brands of products28, seven of them jewelry, and includes color film and a canned foods rack, along with a few obscure branded tech items. I only checked the first five tech items listed, but found no deals. Not only were their “retail” prices grossly inflated, but their “deal” price was beat every time with just a few seconds of Googling. The WUN “Marketplace” offers grocery coupons and “free” items, but once again there are numerous sites on line that offer the same things for free. Just Google “free grocery coupons” or just “free crap”. Seriously, that works! WUN has also thrown in the “Newsstand,” which provides up to three magazine subscriptions per year. At least that’s worth eight or nine bucks a month. WUN doesn’t hide the fact that several of these items are free. They openly offer “Dealstream, Discounts, and Cashback” (from the 5,800 affiliate vendors), along with Grocery Coupons and the Travel Booking Portal as “free benefits” to those who enroll as free customers. In this case, the convenience of having all in one place is a benefit considering there is no cost to outweigh it. Keep in mind, even if you do find a few products that you save a little on, you have to have savings in excess of $100, every month, to make it worth the monthly $99.95 fee. I started to write that websites that offer coupons, deals and discounts are a dime-a-dozen. But I deleted that. Because it wouldn’t even cost you a dime. For all dozen. The cost is $99.95 with 90 CV. This works out perfectly since 90 is precisely the amount of personal volume points you need to qualify in the compensation plan. But if you don’t want the Finance and Language products you can buy the “Gold” package for $64.95, which would seem to suggest those two products have a $35.00 value. However, the Gold only gets you 45 points, so you’re going to have to find a retail customer to make up the difference. Of course, you could also go “Silver” for $24.95 if you only want the top three items on the list, and just the CyberWatch part of WUN Protect, but that’s only 8 points. Even if you sell ten more of those, plus your own, you won’t quite qualify. It’s pretty clear they really, really want you to buy the Platinum package. So here, literally, is the million-dollar question: Is there enough value here to induce a customer, who has no interest in the compensation plan, to pay $99.95 for these items? That’s $77.59, or $57.60 if you’re an individual who pays for the language plan annually. So the real question becomes, would a significant number of people, who have no interest in the income opportunity, and only want this product, actually want all of these disparate products, and be willing to pay an extra $22.36 to $42.40 per month ($268.32 to $508.80 annually) for little more than the convenience of having all of these products in close proximately? Keep in mind, even if there is some amount of financial benefit here that is exclusive to WUN members, it would have to be significantly in excess of $268.32 to $508.80 annually for the member to come out ahead. One prominent WUN supporter has produced his version of their relative value list, which comes out a lot higher than mine, of course. But to accomplish this he only compared travel club costs to those offered by other MLMs, which are a small fraction of all that are available, and among the most costly. He also acknowledges the financial product can be found elsewhere for free, agrees with my values for the Language, Taxbot and Invisus products, so the only way to make the value of a Platinum Package greater than $99.95 is to give a high value to the essentially free Market Place and Grocery Coupon products – or buy three really expensive magazine subscriptions. In reality, people will much more likely want some of these products, and at different times. So you want to go to Cabo for seven days this summer? It would take almost as much time to do this… http://bit.ly/1it83zF, as it would to log into your WUN account and perform the same search. Same thing if you need to send some flowers, or get a good deal on a new iPad. And how does a Silver package warrant a monthly fee of $24.95 when Invisus’ CyberWatch program costs $4.95 per month, and a myriad of completely free, local deal, grocery coupon and discount product search engines orbiting cyberspace? Why would anyone ever choose this product? But then, it appears they are not supposed to choose this product. I’m not at all suggesting these products within these packages are not great products. They’re just not WUN’s products. There’s no way to rationalize “sharing” something with a retail customer that involves an annual expense of almost $1,200 without it also involving some serious selling skills. Especially a product that is very likely worth less than $1,200 annually. WUN claims their compensation plan is “patent pending,” and back in December of 2010 actually referred to it as “patented.”38 Although it seems hard to believe, a number of companies and individuals have, in fact, managed to patent their plans.39 However, after searching both patents and patent applications, I can find no evidence that a patent for the WUN plan is even pending. The plan has gradually morphed over the years, but it’s always been a Unilevel. Their “Group Retail Commission” does reward retailing, a little. This unilevel is the payout only on the affiliate products purchased through their web mall, not on Silver, Gold and Platinum packages. The Unilevel pays 25% on the first level, 10% on the next five, plus 5% on an extra generation for those who have reached “Founder 7” (F7) or higher, which pays “all” levels down to the fourth F7 in the line. The fine print states “Max payout of 100% of GRCV.40” However, that’s a mathematically maximum 80% payout just through the first seven levels. So, although this appears as though you can get paid many levels deeper, in reality, this 100% payout cap also caps the number of levels paid on at eleven.41 So it doesn’t keep paying down to four F7s, it can only pay down four more levels. But, before we go any further, let’s establish what this is 100% of. Because it is not sales volume. WUN pays on “Volume” points, or Commissionable Volume (CV). They love to talk about their $99.95 Platinum Package because it is worth 90 CV, or 90.2% of the price of the package (90/99.95). Most MLMs use a CV, or BV (Bonus Volume) point system, and the industry average CV-to-price ratio is around 83%42 so, so far so good. But then we get to the $64.95 Gold Package, which carries a CV of 45 (69.3% of the price). Of the $24.95 Silver Package, only eight CV is commissionable. So, although the Silver Package is about one-fourth the price of the Platinum, it will take twelve of them to reach the requisite 90 CV qualifier. But then, at least it’s not early 2012, when the CV of a Silver and Gold Package was 6.25 and 12.5, or most of 2013, when it was 3 CV and 9 CV respectively. Again, those Group Retail Volumes described above are paid on products that Customers (not IBOs) purchase from the HUB, which will mostly be the retail items they search for (DVDs, clothing, iPads, etc.) that various retailers pay WUN a small affiliate fee for. WUN claims this can be as high as 40%, but that’s a bit deceptive. The vast majority of such affiliate commissions are between 1% and 15%, and average around 5%. And again, that’s what’s paid to WUN, which then sets aside “up to” 50% of this volume (they do not disclose what determines this percentage), then divvies up the remainder via the above described Unilevel.43 So when you see a 10% payout on levels 2 through 6, that’s more likely 10% of (at most) 50% of the 5% affiliate fee paid to WUN, not 10% of the product price. Awaken is $48.00 for a 24 pack. Yes, that $2.00 per can price is decent, but only half of that $48.00 is commissionable (it’s 24 CV). And the price of a 24-pack is “comparable,” or “competitive,” to store prices, but not actually lower than store prices. A 24-pack of Red Bull is $44.00, and comes with a free flash drive44. A 24-pack of Monster can be had for as little as $29.99 – for 16 oz cans!45 So, it would be tough to make the argument that this price will generate twice as many sales to compensate for the halved commissions. The Finance and Taxbot products each cost $19.95 per month, but only 5 CV is applied to the compensation plan payout. So basically, you’re only getting paid on a fourth of it. This goes for the two powdered versions of Awaken, too. The Trivani products have CVs from 6.2% to 40% of the price, and average 32.2%. So you’re only getting paid on less than a third of what sales are made in your downline. Overall the line averages 35.9% CV-to-Price. But, to be fair, we should apply at least some weighting to the more popular, and higher CV product. That is, they’re surely selling a lot more Platinum packages, where the CV is 90.2% of the price, than Gold packages, where it’s 69.3%, and a lot more Awaken (50%) than Trivani Mouth Rinse (27.4%). So let’s give the Platinum Package quadruple weight, and double the weighting of the Gold Package, the Finance and Taxbot products, and the Awaken beverage line. This isn’t 100% accurate, but certainly more accurate. And if you think the Platinum Package should be given far more weight, because it accounts for “probably 99% of sales,” as one ex-WUN rep guessed, then hold on for the Legal Concerns section below and you’ll understand how I am actually giving them the benefit of the doubt here. This brings the CV-to-Price ratio to 42.1%. To be clear, when CEO Kirby Cochran told a room full of WUN enthusiasts, “We approach 100% payout on our 90% PV… we operate off of a very small margin,” he was referring to only the Platinum Package. That’s it. If you factor in all of their other products you’re getting paid about 100% of 42% of the product cost, which basically makes it a 42% pay out, which is not bad, but on the low side of what is considered a competitive payout (most plans today pay out between 40-50% of actual sales). And this doesn’t even consider their MarketPlace products which, at the time I checked, all had CVs of between 1 and 3. Yes, that’s a one and a three – like the Dr. Dre Headphones for $279.95, of which 1 CV goes into the plan. Or the Sterling Silver Pearl necklace for $178.00, which is 3 CV. This is what I was referring to earlier regarding the “Retail Commissions” of 10% of 5%. In these two admittedly worst case examples, you’d be paid 10% of either 0.04% or 1.7% of the product price respectively. If you’re having trouble following the math, I’ll help you out. That comes out to a reeeeally small number. This CV-to-price ratio of 42%, which is about half the volume that average CV using MLM companies pays on, comes into play in an even more impactful way when it comes to qualifying. Stay tuned. A plan can be front, middle, or back weighted. A front weighted plan spreads the payout more evenly. More participants make money, but those who do make less, on average, because it’s spread more thinly across more people. A “compressed” unilevel plan that pays 40% on the second level (e.g. pays five levels, 5%-40%-3%-2%-%1) would be a front weighted plan. A back weighted plan is one where fewer participants make money, thus those top producers make more due to the concentration of commissions on that smaller group. Most break-away plans, like those used by Nu Skin, Amway, and Shaklee, would be considered back weighted. They have the highest percentage of millionaires, but also the highest percentage of those making no profit at all. Of course, a plan cannot be all things to all people. When you add weight to one part of the plan you must remove weight from another. A survey of over 7,700 distributors46 and prospects included the question “What is the minimum you would have to earn on a monthly basis for you to consider yourself successful?” The question was further qualified by explaining we were looking for their “primary income goal,” not their “dream goal.” Six percent checked $84,000 (one million per year). Which means 6% still misunderstood the question (it’s likely most would still consider themselves successful if they only made $50,000 per month). Another 8% said they only wanted a “supplemental income” of $200-$300 per month. The remaining 86% were just looking for a “comfortable living income,” which they quantified as between $7,000 to $11,000 per month. Their primary objective when joining an MLM opportunity was to quit their job and live comfortably off of their MLM residuals. Clearly the vast majority of MLM entrepreneurs are looking for a more balanced, middle weighted plan (although most of them are oblivious to it). In spite of this, the majority of existing compensation plans are not only front or back weighted to some degree, it has become common to heavily weight pay plans to one extreme or the other due to the more attractive hypothetical incomes which they produce. 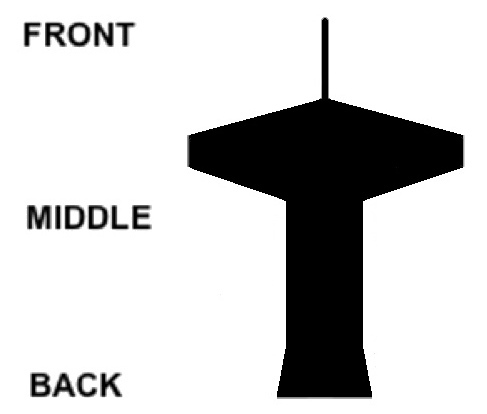 The most common design weights the payout in the form of an hourglass, with the bulk of the payout shifted away from the middle to the front and the back. This is not only a complete contradiction to the optimum weighting for over 86% of the market, it is diametrically opposite of the manner in which downlines form – which is in the shape of a diamond. So, where does WUN fall? Is it weighted like a diamond, or an hour glass? Or, perhaps it’s more like an arrowhead pointing downward, with the diamond shaped payout skewed slightly more towards the front, or top. That would be, according to 86% of WUN’s market, ideal. Well, imagine the shape of a push pin. Something kind of like this image to the right. Although, to the plan’s credit, this is a rudimentary form of middle-ish weighting, it’s where they took the pay out from, then where it was added, that bothers me. There’s essentially no very front end, and less in the actual middle, and this appears to be in lieu of extra padding in the front-middle, and on the very back end. In other words (and few sentences deserve to be restated in other words than that one), you get paid nothing upfront, even if you have a small downline under two first level reps, then break even at Director 3 (with three on your front line). But then you get paid a few hundred dollars per month with the fewest distributors I’ve seen in any plan since compressed unilevels were popular in the 90s. If you are among that 8% who desire only a supplemental income, this is a perfect plan for you. However, if you are among the 86% that want a “comfortable, living income” of $7,000 to $11,000 per month, so you can quit your job, you’ll have to achieve at least Founder 6. Not only do a fraction of 1% of all WUN reps achieve this income, less than 1% achieve Founder 4, and all nine ranks above that, combined. Based on WUN’s Income Disclosure Statement, Mr. Cochran would had to have been referring to lifetime earning. Having said that, Mr. Cochran’s claim that 4.7% (47 out of 1,000) of WUN rep’s eventually earn at least $1,000 is still impressive, on its face. However, 14% earn $99.95 to $115.00 per month, so they would all earn more than $1,000 annually – but make little, if any profits – and 96%, in total, earn this amount or nothing. To begin qualifying for those Unilevel payouts, or to qualify for any payout, you must first achieve 90 CV in personal purchases, or sales to Preferred or Retail Customer, and sell at least 90 CV worth of product to three customers or IBOs. In other words, buy a Platinum Package and recruit three others who buy a Platinum Package. The large majority of MLM reps in any opportunity never recruit their first person, and rightly deserve no commission. But a much higher percentage do recruit one or two. In WUN, if you sponsor two stars and one or both build substantial groups, you’re paid nothing. Compensation plans should not be designed to compensate. They should be designed to incentivize. Every aspect of an MLM comp plan should have a good answer to three key questions: 1) How much will this add to the overall payout? ; 2) What behaviors does this incentivize? ; and 3) Are there any unintended, negative consequences? In WUN’s case, by delaying participation in the compensation plan until a third 90 CV sale is made strongly encourages what’s called “bonus buying.”That is, once you have enough activity below the one or two people you’ve recruited to earn you more than $99.95 per month, you can buy your way into this income by paying for someone’s Platinum Package. Once you enroll one IBO or customer you are a “Director 1.” Which, again, earns you nothing but the title. When you enroll your second person you get promoted to a “Director 2.” The benefit is that you get to put a “2” at the end of your title instead of a “1.” Those of you who read my Empower Network review48 already know what I think of Aussie Two-up plans49. This is even worse. You not only don’t get paid on your first two, they don’t even roll up to your sponsor! Once you land your third sale, you become a “Director 3” and earn a monthly $100, which covers your own $99.95 monthly Platinum Package fee. Numerous reps call this a “three and it’s free” bonus, which is not actually true, and a legal no-no. Your income covers the cost, but you’re still paying for it. WUN will tell you that any combination of products can be purchased or sold to reach the requisite 90 CV, but clearly the plan strongly incentivizes, and is based on, everyone buying a Platinum Package. Any other combination of three products won’t get you even close to break even if you’re paying for the Platinum Package. Similarly, if you use any other product combo to achieve 90 personal CV, it will take a lot more than three sales to cover your monthly cost. When you have at least 1,080 CV in your group, with at least 360 CV in each of your three legs (four WUN-folk who each product 90 CV) you become a “Founder 3,” the $100 Director Bonus cease and desists, and you start earning a $600 Founder Bonus. So, once you come within five Platinum Package sales of achieving the required downline 12, you now have the option of paying $499.75 (for five Platinum Packages for friends or family members) to get a $600 bonus. And Founders get to play in the Group Retail Commissions (Unilevel) now as well. As your legs continue to build, just cancel the PPs you gave your friends or family members as you no longer need them to reach the requisite 12. Yes, this is a scummy, and very legally suspect way to earn the bonus, and yes, WUN’s policies forbid this practice. But their compensation plan is designed to powerfully incentivize this behavior. Unintended consequences. If you build to a minimum of 2,500 CV (28 Platinum Package sales will get you there, as long as no more than 50% is from one leg), you get a bump to $700 per month. 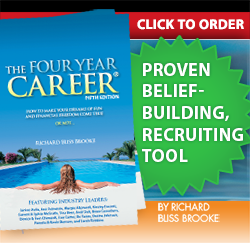 Five-thousand CV earns you $800, and 7,500 CV pays $1,000. Enroll a fourth person who produces 90 CV and produce 10,000 CV in those four legs, and you’re a Founder 4, and earn $2,000. This keeps going to Founder 7 which required 80,000 CV (889 PP sales), no more than 40% of which can come from any of at least seven legs, and you are paid $10,000. As you can see from the chart below, seven more ranks can be achieved each requiring ascending amounts of group CV, which gets you more shares of Leadership pools and other bonuses (to be discussed in a moment). One of the challenges with any plan that requires a certain number of reps of a certain rank on your front line, and why I never employ such a feature in any plan I design, is that it introduces a luck factor that can produce rewards wholly out of proportion to production. For example, if I sponsored seven IBOs on my first level, who each sponsored the minimum three to become a Director 3 (i.e. I have 21 IBOs on my second level), and my group produces 640,000 CV, I’m a Diamond. However, if you sponsored 50 on your first level, but only six are Director 3s and the other 44 average 1.5 recruits each (i.e. you have 84 qualified IBOs on your second level), and your group generates over 1.2 million in CV, you’re a Founder 6. You’ve sponsored over seven times as many people, have four times as many PP sales on your second level, and almost twice the total Group Volume, and you are seven ranks lower than me. And if you then buy one Platinum Package out of your own pocket and give it to someone on your second level, you instantly jump seven ranks. Although this example is somewhat extreme, it’s not entirely unrealistic. Nor are the myriad of more common scenarios where the same unfairness, and incentive to bonus buy, occur within such plans. The quote above is referring to the alleged average earnings per distributor. It’s also utterly wrong. I know because I did just such an analysis, albeit backing the late 1990s, and it runs between $2.50 to $5.50. If anything this average has risen since then as MLM product prices have inflated as more companies compete with their comp plans rather than product value (still not the majority, but getting closer). The key factor is the amount of sales volume produced per rep, not the percentages in the plan. Having said that, WUN’s earnings-per-rep ratio is a healthy $33.33 when you earn your $100 Director bonus on your first three people. Even at the Founder 3 rank, you’re earning $600 on 12 people, which is $50.00 per rep. And no, there’s no “however” lurking in the margins of this paragraph, waiting to strike. At Founder 4 you’re paid another $1,400 on $8,830 of additional volume (16% of volume, or $14.14 per person). This ratio drops to a still impressive $17.86 overall, and at Founder 5 it’s $19.93 overall, Founder 6, $13.48, Founder 7, $11.25, and when you hit Executive it’s still $7.50. And this isn’t even counting the Leadership Overrides and luxury bonuses. Or, the Group Retail Commissions. So sure, if you need some change for the gumball machine, count that, too. Having said that, this healthy income-per-person ratio at these higher ranks is impressive, but offers nothing if you can’t qualify for them. Leadership Overrides are paid out from a pair of bonus pools. 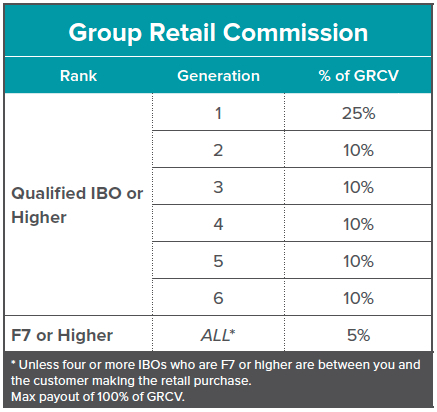 “Up to” 5% of total company CV is poured into the “Founder Override reserve” and “up to” 7.5% goes into the “Executive Override reserve.” The Founder’s pool is paid to all IBOs who qualify for Rank F4 to F7, who each receive an ascending number of shares from one to ten. The Executive pool not only pays an ascending amount of shares, from one to 24, to those who qualify for Executive and above, but each receive ten shares of the Founder’s pool as well. As we’ll discuss in more detail later, WUN is too young to have amassed large numbers of Executives and above yet, but when (if) they do, the stated “maximum” pool earnings at each rank will likely appear silly, and not in a good way. At Founder 4, it’s $500, but eventually this pool is going to get split into so many pieces that a single share will be worth only a few dollars. Let’s assume, for example, that when WUN reaches 100,000 current, active participants, producing an average 90 CV, and with a slightly better breakdown of what percentage of IBOs achieve each rank than they depicted in their most recent Income Disclosure, the Founder Pool will be 450,000 CV, which will be divided by about 29,000 shares. That’s $15.52 per share. And since the size of the pool rises and falls commensurate with the number of shares distributed, this could very well be about what a share is worth right now. Also, contrary to what was stated in a recent WUN training podcast51, the value of these shares will not rise commensurate with overall company CV. As more CV is produced, more IBOs will qualify for more shares, keeping the per share value somewhat consistent over time. So although those big numbers in the “Max” column in the above chart are rich and handsome, much like a Match.com listing, they’re significantly embellished. 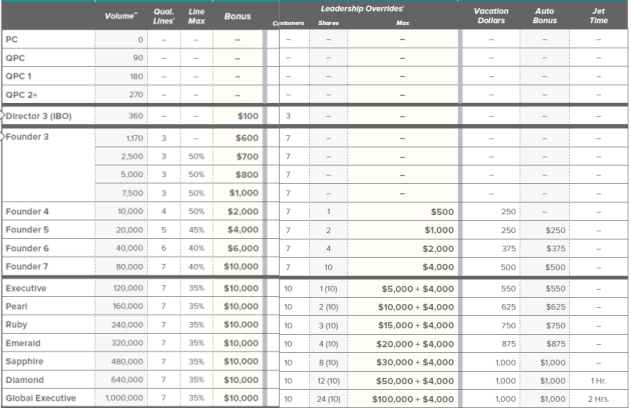 The “Luxury Payouts,” which begin at Founder 4 (F4), pay you “Vacation Dollars” from $250 to $1,000, and a car bonus from $250 at F5, up to $1,000. These bonuses are a nice touch, however, you must incur the entire expense first, and then submit your request to have your accumulated “Vacation Dollars” be applied to the expense. For example, if you want to use these Vacation Dollars towards a trip to Hawaii, you must actually go to Hawaii, and incur all of the expenses, then come back and submit your request for reimbursement, and wait up to 30 days to get paid, assuming your trip qualifies (you have to submit proof that you took the trip, including photos and a video telling WUN about your trip). Same with the Auto Bonus. You must buy or lease the car first, then apply for payments. In other words, if you can’t afford a down payment or lease on a new car, or a trip to Hawaii, you still won’t be able to afford it no matter how many Vacation Dollars you have pilling up. Sure, you can put it all on a credit card (assuming you have enough remaining credit), and hope that the company will agree, or be able, to pay you 30 days after you return. And when they are paid their Vacation Dollars (which is likely), will that IBO really use that $3,500 to cover their family’s week in Hawaii, or to pay off that $3,500 they put on their MasterCard? Or have more fun with it? Sure, that’s on them. Absolutely. But why even place your IBOs in this position? Your “Vacation Dollars” are yours. You earned them. I get WUN’s desire to have IBOs really use it for cars and vacations, but why not allow them to pay for it straight out of their Vacation Dollar account? I also found Mr. Cochran’s recent announcement of a mortgage “payoff” option to be very overstated.52 Previously, if your monthly Luxury Bonus exceeded your car payment you either forfeited the difference, or you could simply increase your car payment to match and pay it off faster. This new option, presented as a big announcement that prematurely leaked, allows those with mortgages to apply this excess to it rather than their car payment. The audience’s reaction was rousing applause. Mine was, so what? So, you have a car payment of $200 and a bonus of $250. Whether you apply the extra $50 to a car payment or a mortgage, it’s still $50 less out of your pocket. This would only offer a benefit to those whose interest rate on their mortgage is higher than the interest on their car payment, and with 30-Year-Fixed now running about 4.4%53, the odds of that are slim. On the plus side, you do have the option of gifting the event tickets to someone else, and in the case of the Auto Bonus, you can elect to take 50% of the Vacation Dollar bonus in lieu of a car payment. Both are better than nothing. In October of 2013, WUN added a “Customer” qualifier to each rank of the plan. Director 3s not only need to enroll three IBOs, but also must enroll three Customers. A Founder 3-7 requires seven Customers, and an Executive and above requires 10. WUN defines these Customers as “Preferred Customers, Insiders, customers who checkout or redeem shared deals as a guest, really any customer who purchases retail product.” However, an “Insider” is defined as, “A Deal Stream Insider is a member who subscribes to WakeUpNow marketing messages and deals, typically via social sharing,”55 and guests need only “check out” the shared deals to count. What’s more, even IBOs who have not yet reached Director 3 count as “customers,” as do those who enroll and choose to not purchase anything56. So, which activity does this more strongly incentivize? Acquiring new retail customers, or getting a few friends to sign up for free? I’m also curious to know how Founders are protected from having seven “Customers” and then one of them enrolling as an IBO without the Founder’s knowledge (and leaving them one short of the required 7)? This creates the unintended consequence of not wanting your Customers to become IBOs. At least, not on a Friday. Now, after all those volume qualifiers have been described, let’s revisit that 42% CV-to-price ratio. Remember those three people you had to enroll who each have 90 CV to be a D3 and earn the $100 bonus? Or the 1,080 CV over three legs to get to F3 and join the “$600 Club?” Or the 80,000 CV to qualify for F7, or the 1 million CV to achieve Global Executive? Now, giving WUN every benefit of the doubt – that is, as they claim, they are not just pushing Platinum Packages to everyone to qualify, but indeed are “sharing” a wide variety of individual products of value – and thus assuming my weighted average57 of 42% is more in tune with reality, it will actually require about $855 in sales to achieve 360 CV, $1,425 in sales to get to 600 CV, $2,565 will produce 1,080 CV, and you’ll have to amass $190,024 in sales to get to Founder 7 (assuming it’s all spread out in the correct structure). To achieve their highest rank of Global Executive plan on your group producing around $2.37 million. Which probably explains why no one has ever qualified of this rank. At least, not yet. Bottom Line: CV is not sales.Whatever ratio you want to use, it’s going to take significantly more sales than these CV qualifiers suggest. WUN is among the growing number, but still minority, of MLM companies who publish an Income Disclosure Statement. As with all such statements, they’re hard to fall in love with at first sight. They tend to reveal a very large percentage of reps earning little or nothing, and a disproportionate percentage earning the largest incomes. Of course, that’s because the large majority of MLM reps, or human beings for that matter, tend to not apply nearly enough effort, for not nearly enough time, to succeed. That’s why the income distribution of Americans in general looks very similar to an MLM company’s income distribution58. But, this is a rant for another day. In WUN’s case they show 54% of IBOs as not even achieving Director 1 (haven’t enrolled one person), and 18% have achieved D1. Another 10% achieved D2, and 14% made it into the money by achieving Director 3. Unlike all previous quarterly disclosures the 82% that were below a D3 made absolutely nothing. Zero. D3s earned an average $101.90, which would be their $100 Director bonus and some gumball money from the Group Retail Commissions. 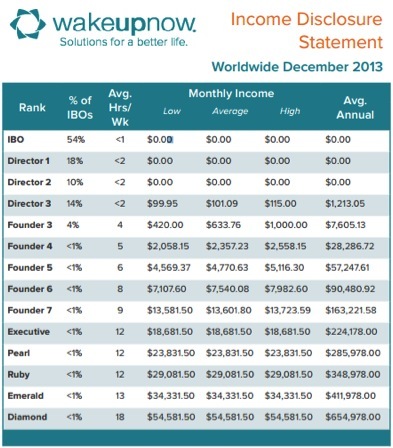 When analyzing commission trends since their Q2 2013 statement (the last three published) I found it curious that all average incomes from Founder 3 and above are slightly trending down, while the percentage of IBOs below D3, and earning nothing, has slightly ticked up. As an MLM company grows, as WUN has been in recent months, average incomes should be slowly rising across the board. Although WUN does not report the number of IBOs at each rank, when the “low,” “average,” and “high” incomes are all identical, it’s not hard to figure out that there’s one person at that rank. This was the case for Founder 7 and Pearl (the highest rank anyone achieved) in the second quarter of 2013. That’s nothing unusual, especially for a young, pre-momentum company. However, in their August 2013 statement, they had one Executive, at least three Pearls, no Rubies, and a single Emerald and Sapphire. By the end of December, they had one each of Executive, Pearl, Ruby, and Emerald, zero Sapphires, and one Diamond. Granted their Q1 2014 Disclosure isn’t out yet, but considering they’ve been celebrating their strong growth since the middle of last year, and are now claiming to have amassed “over 100,000 customers,”59 there seems to be a dearth of participants partaking in the higher ranks of the plan. Not that there isn’t a very robust back end to the plan. In fact, the back end is loaded. However, very few reps seem to be able to get to it. Included on all WUN Income Disclosure Statements are the number of average hours per week that each ranks spends on their business. Although they appear to be somewhat arbitrary, WUN claims these numbers are derived from “estimating and surveying,”60 but no sample size is revealed. For example, the Statement suggests Directors 1 and 2 each spend fewer than two hours per week building their WUN business, as does a Director 3, inspite of the $500 monthly increase in commissions if they were to advance one more rank to Founder 3, and with a mere nine additional Platinum Package sales. Founder 3s should be the most active rank on the chart. Even the top six ranks spend only 9-18 hours a week on generating their average $13,602 to $54,582 per month. To put this in perspective, the DSA’s research shows about 10% of all reps work “full time” on their businesses61, and other credible sources peg the “full time” workers among all direct sellers (not just MLM) at 30%62, or show 12% of MLMers working over 20 hours (and 45% work 5-15)63, and the average per week for all active distributors is 16.8 (mean is 12)64. Methinks the “Avg. Hrs/Wk” column is inaccurate, and creates an unrealistic expectation as to the time it will take to achieve these incomes. Too bad their Income Disclosure Statement, which suggests Founder 7s only work 9 hours a week, isn’t as candid and forthcoming. I do like the larger per-member payouts from D3 to F7, but there’s a trade off for these gaudy ratios. If you only enroll two, no matter how many they enroll, your earnings-per-member is zero. Build a 2×2 downline of 1,000 people and the combined earnings of all of them would be zero! Yes, I know that’s perfect math, and that’s ridiculous. But any plan is flawed if all participants enroll only about the average number of recruits and no one makes a penny. And that’s based on the optimistically flawed, but generally accepted average of 2.6 recruits per distributor.68 Consider this, if ten distributors are surveyed and nine sponsor none and one sponsors 20, the average is two, even though no one enrolled two people. In reality, this 2.6 average is generated by a mass of participants enrolling zero, one or two, and a very small percentage enrolling three or more. Overall, it’s hard not to like a plan that at least tries to be middle weighted. The WUN plan does, and succeeds to a degree. But again, wherever you shift the payout to, you have to shift it from somewhere else. In spite of the high “however” count, I’d actually give this plan a solid B. It’s kind of like last Thanksgiving when I decided I was going to take the burden off of my elderly mom by doing all the baking for her. By popular demand, I made six pumpkin pies, diligently following her recipe to the letter. Except I forgot the sugar. The intent to do the right thing was there, but the execution was very flawed. Kind of like the Wake Up Now compensation plan. The WUN P&Ps are not particularly unusual. It contains much of what can be found in most MLM P&Ps. Not that this isn’t troublesome, it’s just not unusually so. First, the good news. Their compliance section is one of the best I’ve seen. In this case they are unusual in that they don’t just say “don’t make income claims” or “if you make an income claim include the disclaimer” (I’m paraphrasing). They actually go into detail about what exactly you can and can’t say and under what circumstances. For example, they describe “lifestyle” and “hypothetical” claims as being the same thing, from a regulatory standpoint, as an income claim, and thus requires the same disclosure. And, unlike many MLMs today, they seem to have been well educated on the difference between a disclaimer and a disclosure. The FTC changed the rules a few years ago where a disclaimer (e.g. “results not typical” in fine print) is no longer acceptable. Now you need a full, prominently displayed, Income Disclosure (or link to one) that declares what results are typical. Which explains why WUN, and a growing collection of other MLMs, are now producing these Income Disclosure statements. Now if WUN could just get more of their reps to actually read their P&Ps, and adhere to this guidance, that would be even better. Because, with some exceptions, it doesn’t appear as if they are doing so. Although there are surprisingly few (relatively speaking) blatant income claims sans any disclosure, the income claims I’ve seen often include only a brief, way too subtle, disclaimer, not a prominent link to the Income Disclosure. However, corporate produced material does it right (see, not every “however” is bad). Even small meetings where Mr. Cochran spoke (on video) and made income or lifestyle claims, he did provide the proper disclosure, and used it as a teaching moment.69 In the same presentation he stated, “I live, drink regulatory.”70 When it comes to income claims, I’d like to see their reps use their disclosure statement more, and in a more compliant way (most who use it online are not making the link prominent enough), but in this one regulatory area WUN is ahead of most MLM programs. However, that’s a much larger area than just income claims. WUN does include an atypical policy against poaching reps from other MLMs. If you try to pirate your own WUN downline into another MLM that’s a terminatable offence, of course. But section 4.11 titled “Targeting Other Direct Sellers” only states WUN does not “condone” it. What’s the penalty for engaging in such activity? You “bear the risk of being sued by the other direct sales company.” And if you are, “WAKEUPNOW will not pay any of IBOs defense costs or legal fees, nor will WAKEUPNOW indemnify the IBO for any judgment, award, or settlement” (emphasis original). What’s odd about this is that it is extremely rare that the company is not also named in such lawsuits. If it were me, I’d actually make such activity a policy violation, not something that’s just not “condoned,” but tacitly allowed – because it does appear a lot of their new reps are coming from other network marketing companies. A policy that is not unusual, but which I abhor, are those that require “Continuing Development Obligations” (5.2), “Ongoing Training” (5.2.1), “Increased Training Responsibilities” (5.2.2), and “Ongoing Sales Responsibilities” (5.2.3). These are fine when a retirement clause is included that overrides these requirements, but I’ve only seen such a clause in about a dozen P&Ps – the ones I wrote. Without such a clause, how does one retire and live off of their “residual income” without violating their company’s P&Ps? An unusual policy I like is 8.3, which states an IBO “will not be terminated for merely requesting a refund…” Most companies will. However, 8.1 provides for only the federally mandated three day refund period (5 days in Alaska) to get a full refund on all monthly auto-pay products, then a 75% refund from 4 to 7 days beyond the charge, plus a 10% service fee. After seven days there are no refunds. This would include the Platinum, Gold and Silver packages, and most components if purchased a la carte. Several states, including Georgia, Massachusetts, Wyoming, Maryland, Louisiana, Montana, Oklahoma, and Texas, as well as The State Without a Star (Puerto Rico), all have their own refund policies that MLM operations are required to adhere to, each requiring at least 30 days, and most 9071. Also, how could any bona fide customer of these products even begin to assess the value of these products in a mere three days? Or, even seven? Of course, if you’re just buying a Platinum Package to qualify, then this makes perfect sense. Section 8.4 breaks down how refunds are clawed back from the immediate upline when a refund or chargeback occurs after commissions have been run. Note, I said the refund is clawed back, not commissions paid. That is, the entire price of the product is recouped by WUN from the pockets of their IBOs, as if the refund never occurred! So WUN still gets their money, but now pays very little, in any, commissions on it. In addition to this prorated “refund liability” to those IBOs five levels above the refund (from 30% to 10%, depending on how many levels the IBO is above the refund), WUN also charges a $100 “service fee” – to all five of them! 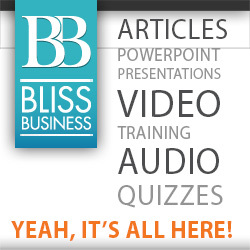 Think about what behavior that incentivizes? If someone you sponsored is about to ask for a refund on a $99.95 Platinum Package, and you knew you were going to get hit with a deduction of 30% of that ($29.99) plus a $100 fee, is there any way you’re not going to cover their $99.95 fee? I can see no other reason for WUN clawing back the entire purchase price of the product (not just the commissions paid) from those five levels upline, plus gouging them for another $500, than to incentive eliminating refunds and charge backs in this manner. WUN can also warn, fine, suspend, or terminate IBOs for “any illegal, fraudulent, deceptive or unethical business conduct, or any act or omission by an IBO that, in the sole discretion of the Company may damage its reputation or goodwill (such damaging act or omission need not be related to the IBOs WAKEUPNOW business).” In other words, for doing things that are not necessarily illegal, or even in violation of their policies, and may not even have anything whatsoever to do with Wake Up Now. Sure, a lot of MLMs have this in their P&Ps. That doesn’t make it right. WUN also has a mandatory arbitration clause (9.4) where the IBO “waive rights to trial by jury or to any court.” According to the 9th Circuit Court (Pokorny v. Quixtar)72 such a clause is not enforceable. Section 10.3. entitled, “Sales Taxes” states, “WAKEUPNOW is required to charge sales taxes on all purchases made by IBOs and Customers, and remit the taxes charged to the respective states. Accordingly, WAKEUPNOW will collect and remit sales taxes on behalf of IBOs, based on the suggested retail price of the products, according to applicable tax rates in the state or province to which the shipment is destined.” The problem is, WUN doesn’t do any of this. They have no “suggested retail price” on any of their products, and they don’t charge sales taxes on any products outside of Utah. Please understand that I’m not at all suggesting that WUN management are such scoundrels that they deliberately placed all these booby traps in their P&Ps. A lot of this is just boilerplate verbiage that gets cookie-cuttered from company to company. But some of this is unique to WUN, and can best be described as draconian. Let’s work from small to big. Gas & Electric companies are listed in red. If you’re curious, Herbalife has 13. So other than energy companies, which are always bombarded with slamming complaints, WUN’s 49 complaints ranks 6th. MonaVie, Nu Skin, XanGo, Zrii, Send Out Cards, Morinda, Neways, Shaklee, Agel, USANA, Mannatech, Vemma, Purium, ForeverGreen, Youngevity, Gano Excel, Yoli, Freelife, Life Force, Reliv, and Amway also have 49 complaints – combined. To their credit, they have made the appropriate effort to resolve all 49 complaints. How a company handles their complaints is actually more important than the raw number of them. WUN management tends to overplay the “we’re so transparent” angle. An Employer Identification Number (EIN) is required of all corporations, or businesses with employees. This is public information that can be used to verify certain regulatory filings (and the fact they even have an EIN number). In fact, it should appear on every 1099 form WUN sent out last January, so it’s not a secret. Yet, it does not appear within either of their annual disclosures, within any of their corporation documents74, nor within several public EIN databases. If you want to join WUN under a business entity they require that you provide them both your social security number and your EIN.75 But when I asked them for this number, I was first told that the only two people who could provide it were in Asia (actually, there would have been several in their accounting office). After two weeks I asked again, and my request was denied. A reason was provided, but within a “privileged and confidential” email that I am not at liberty to quote. WUN has been recently attacked by other industry critics using their public disclosures. It would make sense that they are reluctant to provide them any more fodder. Now, read between those last two lines. When the blog BehindMLM wrote a negative review of WUN76, their response included the statement, “Much of Inside MLM’s article focused on selected items on our 2013 Annual report. That report was honest and comprehensive because we believe in full disclosure. It shows we are honest and optimistic.”77 Actually, it shows nothing more than what they are legally compelled to show as a publically traded company – and that they got me confused with BehindMLM. I’m also not sure the line in their 2013 report describing “substantial doubt about the Company’s ability to continue as a going concern” would be considered “optimistic”. “We strongly feel,” they continue, “this is a strategic advantage over companies that are privately held and not subject to the same level of accountability… The 2013 Annual Report was voluntarily produced and published by the company, and not by any third party.” Again, as a public company they are, once they get large enough, or their stock become active enough78, compelled by securities law to publish such information, and it’s suppose to be audited by an objective third party. WUN’s disclosures are not79. So we are left with having to just trust what they say no more or less than any private MLM company. They have also never published a 10-Q (quarterly financial disclosures), Proxy Statements, a Form 8-K (notice of events pertinent to shareholders), or any of the other public disclosures common to public companies, and only two annual disclosures since 2009. WUN is likely exempt from reporting to the SEC (which is why an EDGAR search returns nothing80) due to their small size and minimal trading activity, so I’m not suggesting any legal impropriety here. Just, don’t gloat about your transparency while refusing to provide your EIN and disclosing the minimum you are supposed to disclose, and not until you could be required to disclose it. Personally, during my research for this review, I found WUN to be one of the least transparent companies I’ve ever investigated. Within WUN’s 2013 Income and Disclosure Statement they claim, “The Federal Trade Commission requires Direct Sales organizations to submit an annual Income Disclosure Statement outlining how many members were paid (at all) at each level, and how much they were paid. Wakeupnow is committed to transparency and has elected to publish its Income Disclosure Statement on a quarterly basis rather than annually. In addition, rather than reporting only to the FTC, Wakeupnow® makes these statements available to the general public via its website.”81 None of this has ever been remotely true. The FTC does not “require” Direct Sales organizations to produce such Income Disclosures, nor does the FTC require that such disclosures be submitted to them. Only when income claims are made are such disclosures required, and the production of such disclosures are completely voluntary, and always made public. About 20 MLM companies currently provide such disclosures, and although most are annual, some are more frequent (e.g. Empower Network’s is in real time). So yes, while it’s admirable that WUN is among the small minority who even produce such a disclosure, they are doing nothing at all special by making them public, as they claim. As VP of Sales & Training Andy Benis recently said, there is “no legal requirement” to produce an Income Disclosure Statement.82 WUN really needs to give Mr. Benis a raise. Considering this, somebody’s got some splainin’ to do. You emailed us 7 days ago inquiring about the legitimacy of a company operating by the name of Wake Up Now, Inc. Since their establishment in 2009, they agreed to maintain their compliance by participating in random evaluations done by the FTC. Since the beginning of their establishment we have found no evidence of wrongdoing or any evidence of broken antitrust laws. There have also been no known complaints filed against them during their years of operation. They have been very cooperative and outstanding in conducting business matters within the corporation and with consumers. They do not operate as a commonly known financial scam known as a Pyramid Scheme. They instead operate as a legal and fully functional marketing company with very strict policies on following compliance. They are federally regulated to the fullest extent every year. But in the event that you may witness any future violations, feel free to contact us again by phone or file a formal complaint and we will continue to respond accordingly. Thank you for contacting us with your concerns. This email is completely fraudulent. The FTC never endorses or approves companies, nor would ever offer a legal opinion on one. When I called the Consumer Fraud division of the FTC to confirm the letter was fake, and began to describe it, the agent I spoke to said his “supervisor” was aware of the letter, had read it, and “she knows exactly what you are talking about.” He then confirmed the letter was a hoax. This could be written off as an act of one rogue rep, except for the fact the earliest reference to this letter is October 24, 2013, and it’s still being used by several, at least what appear to be, active IBOs. WUN claims to have an ever expanding “compliance department” which closely monitors field activity. Yet, in spite of it being one of he most egregious policy violations an IBO could perform, and the creation of a legal red flag large enough to cover Texas, they’ve somehow missed this for almost seven months? There are five states that require MLM companies to formally register before they are legally allowed to conduct business in those states. They are Montana, Louisiana, Georgia, Massachusetts, and Wyoming. As of May 16th, 2014, Wake Up Now has, according to each state, been operating in four of them without being registered. They are Georgia, Massachusetts, Wyoming, and Montana.83 According to Louisiana, when I checked on May 5th they were not registered, but when I checked all five states again, this time using other DBAs and variations of “Wake Up Now” (e.g. WordCraft Systems, founder’s names, Wake Up Now with and without spaces, both Inc. and LLC, etc.) I was told Wake Up Now, Inc. – the identical name checked previously – had been registered in this state since 2009. The other four states reconfirmed no such MLM company was registered. Only Massachusetts hedged my asking for WUN’s EIN number to be certain. Which WUN refused to provide. It does seem odd that they would only register in one of the five states, but even weirder that the other four would get it wrong, twice each. I also don’t give much weight to this. Even if they aren’t registered, if they get busted they pay a small fine and a registration fee. That is, except for Montana. They play a little rougher. But hey, it’s Montana. Update (9/3/14): I have been notified by a WUN representative that WUN has, in fact, been registered in all five states since Octbober of 2013. This may very well be true, but in the absense of any participation by WUN during the researching of this review, all I can go by is the information provided to me by representatives of these states. “Pump & Dump”84, as it relates to stocks, is a scheme usually associated with pink sheet, or over-the-counter penny stocks. That is, those worth a few pennies with very little trading activity – like Wake Up Now. The reason such stocks are more vulnerable to P&D schemes is that they are much easier to manipulate since fewer trades can effect the share price. Keep in mind, a stocks price is more of a gauge of what the market thinks a company is going to do than what they’ve done. So, buy some stock for, say, a nickel, “pump” it up by making claims about how well the company is about to do, then “dump” it for five bucks a share and you’ve made a tidy 9,900% profit. And as you can see from the chart below, this is about what happened back in 2011. Only it went from a nickel to $5.50. Granted this was before the management shake up that brought in the current team, and a management shake up can stir trading activity and market optimism. But it was about six months before the changeover, so the timing doesn’t jive. 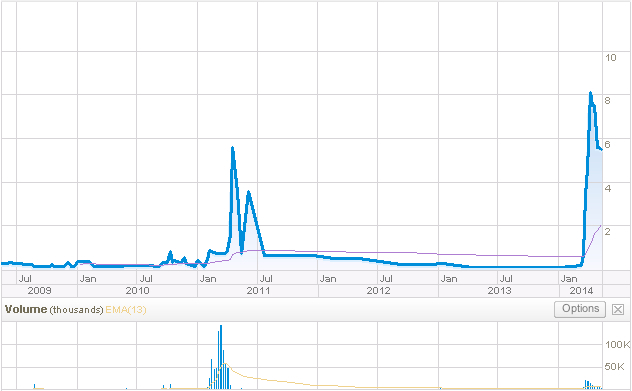 And I can find no other explanation for why WUN’s stock price would pop over 10,000%, then be back down to under a dollar four months later, and back to pennies by early 2013, followed by many months of virtually no trading activity at all. Either way, this wasn’t on the current management team’s watch. However, a similar pattern has recently reappeared. Once again, nothing of significance occurred last March to account for the spike in daily trading activity to over 10,000 shares, after practically none at all for almost two years, and the price skyrocketing from five cents to over $8.00 (peaking in intraday trading to $10.70 on March 31st). And now, as the price begins to fall, there has been not a single share sold in three of the last four days85. 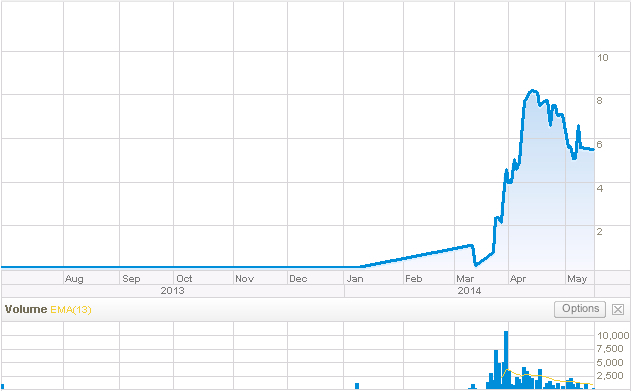 Investor interest went from liquid nitrogen to boiling to ice cold in two months. Something is seriously wrong with this picture. I am not at all suggesting anyone in WUN management is doing the painting, or at least not deliberately to execute a Pump & Dump scheme. The optimism and hype coming from them and field leaders didn’t begin, or wasn’t even dialed up, in March. Nor can this be explained by over-exuberant IBOs who are not sufficiently educated in stock market investing, as some WUN supporters have suggested. As can be seen from their internet activity such exuberance towards WUN began a full year before there was any for their stock. WUN management claims they have produced their most recent financial disclosure in response to this unusual trading activity, so potential investors can be properly informed of their current condition. Yet, at the same time, they continue to claim their financial losses are all part of their plan to build the infrastructure to support their future success. “As for not showing massive profits in the early stages, we’re in some pretty good company. Amazon, Facebook, Tesla and other technology companies did not show profits in their early years,” only to become billion dollar behemoths (although Amazon is still losing millions). And their losses, they claim, are mainly due to their reinvestment in the business to accommodate their imminent growth. In other words, they’re saying all the things that would encourage investors to buy their stock. Again, I don’t believe there’s a deliberate Pump & Dump scheme being perpetrated here, at least not by management. The timing doesn’t add up. Another compelling theory was that competitors to WUN were attempting to buy up all the stock at pennies a share to prevent WUN from raising more capital. But that doesn’t add up either. Most of the trading activity has been after the share price started to pop, so if this were the work of competitors they are only providing more capital to WUN. Whatever the reason, trading aberrations like this is what makes you a blip on the SEC radar, and that’s the last thing WUN needs right now. Especially when they’re telling their IBOs, and potential shareholders, “Wake Up Now is making money”8889 while you’re actually losing millions of dollars. “This is what the typical network marketing company looks like – it’s a pyramid. Is Wake Up Now a Pyramid Scheme? Allow me to begin by saying, MLM downlines don’t even remotely resemble a pyramid shape. They look like roots of a tree, and when the number on each level is plotted out it takes the shape of a diamond. In fact, one of the most ironic things about multilevel marketing is that this is the only type of business that does not form a pyramidal hierarchy! Nor do only those distributors “at the top get paid”. Large branches can form off of that root-like structure at any point along it. And Mr. Cochran, the anti-MLM critics don’t need your help. That mini-rant was irrelevant, but cathartic. Thanks for indulging it. Followers of my Inside Network Marketing91 video blog series will recall episode #2: What’s a Pyramid Scheme92, where it was revealed that the Federal Trade Commission cares little as to how much commissionable product is purchased by the affiliates themselves. Rather, they are more concerned with the motive for those purchases. That is, were the products purchased based solely or primarily on their intrinsic value to the end consumer, and would have been purchased even if there were no income opportunity attached? Or, are they being purchased solely or primarily as a means to qualify for income in the compensation plan? For example, Fortune Hi-Tech Marketing required their reps to purchase a “bundle” of legitimate products ranging in cost from $130 to $400. The more products you purchased, the more commissions you qualified for. Most reps bought more products precisely for that reason. The FTC recently closed FHTM, claiming it was operating as an illegal pyramid scheme93. The FTC, and subsequently the courts, determined that the value of these packages to a non-participant customer (the evidence for which BurnLounge argued was “overwhelming”) was not even “remotely persuasive95.” The crux of the FTC’s claim was based on the “plethora” of other sources for the BurnLounge product (downloadable music), often at a lower price. Case studies that hit a little closer to WUN are FTC v. 2by2.net (aka MallVentures)96, Michigan vs. Km.net97, and FTC vs. BigSmart98. These were all examples of companies that sold online shopping malls that offered a variety of products from other vendors. Each set up affiliate accounts with these vendors where the distributors would get a small discount on all the products purchased through these vendor websites, and a small affiliate fee would be paid to the promoter, such as 2by2.net, BigSmart or Km.net. The promoter would use the affiliate fee to pay commissions on a multilevel basis to the distributors who also bought the web mall. However, they would also charge several hundred dollars for the web malls themselves, which were commissionable products. Since the overrides paid from affiliate fees, from the actual goods purchased via the mall, were miniscule (gumball money), there was no way they could support an MLM opportunity. Legal authorities adjudge these web malls, or “shopping portals,” to be sales aids which only distributors would buy. Obviously, no one bought the web mall that wasn’t a part of the income opportunity. Granted, WUN is not doing the same thing, exactly. But they are in the ball park. So the question becomes, how close are they to home plate? Are there significant numbers of people paying $99.95 a month for WUN’s Platinum Package, who just want the package? Not, is there, in theory, sufficient value to attract customers, or would someone purchase it who is not an IBO, but are they actually doing this? Are there people actually paying $99.95 for a collection of products that can purchase for the same price from the individual vendors (Taxbot, Invisus and Transparent Language), and other products (or comparable ones) that can be found online for free (travel clubs, financial tracking, free items, and grocery coupons), and a Market Place for discounts and deals that demonstrably does not often offer the best discounts and deals? And, why would anyone want to purchase all of these disparate products unless they were actually in the market for all of them? Need a tax tracking system? Go to Taxbot.com and sign up. Are you one of the likely fraction of one-percent of the population who wants both a tax tracking system and wants to learn a new language? Then visit Transparent.com after you’re finished signing up for Taxbot – and pay $49.94 per month instead of $99.95. What? You are actually in the market, right now, that is, you actually want, a tax tracking system, to learn Spanish, and an identity protection and internet security system, too? Even then you’d still be better off to just pay the $79.89 per month (or $51.60 if Invisus is an individual plan, and you pay for Transparent Language annually) by signing up for them individually. And, again, travel clubs, discount & deal sites, comprehensive financial tracking sites, and grocery coupon sites can be found all over the net, for free. Mr. Cochran states, “We pay people to be able to save money and get paid when other people shop and save.”100 But WUN IBOs are getting paid a minute fraction of their earnings from people shopping and saving, and most of their income from the sale of Platinum Packages. In fact, nothing else ever need be purchased. Let’s say Bob enrolls ten IBOs who build a group of 1,000, all buy Platinum Packages and all of them enroll in every product (Taxbot, Invisus, Transparent Language, etc.). Carol enrolls ten IBOs who build a group of 1,000, all buy Platinum Packages and none of them enroll in, or use, any of the products. Bob and Carol will make the same income. A key question is, how many IBOs actually use any of the products within the HUB? If they’re just buying Platinum Packages without using anything within it, over just one or two of the products, this is very damning from a legal standpoint. Sure, one might argue, if someone buys any product from an MLM company and chooses not to use it, how is that the fault of the MLM company? But, that same MLM company, while making the case for their legality, would also have to argue that the large majority of their products are being sold to those who genuinely wanted them, and would have purchased them anyway even if there were no income opportunity to qualify in. So the “it’s not the company’s fault if the purchaser doesn’t use the product” argument paints the arguer in a very legally vicarious corner. Why would someone who genuinely wants a product, and whose decision to purchase it is based only on their desire to use it, not use it? However, purchasing a product as an obligatory step to income qualification, which would not have been purchased otherwise, would seem to be the most valid explanation for purchasing a product that is never used. I would have liked to have asked WUN for this usage information, but… like I said. Those close to WUN have suggested Thunder is now “outselling everything.” However, I’ve also learned that all of this product was sold before it shipped – so how could these high sales be based on the value and effectiveness of the product? I know some will claim here that I am trying to find fault, but I swear, I’m trying to look at this as logically and pragmatically as possible. And through that lens all I see are people basically saying, “I’d rather meet my 90 CV qualification by buying four 24-packs of an energy drink, regardless of how much energy it gives me or what it tastes like, than by purchasing a Platinum Package. And if this reasonable, albeit somewhat cynical, theory is even remotely accurate, there is no doubt what the motive was for selling out the first run of Thunder with these multi-24 pack purchases – and it can’t possibly be due to the value of the product because no one had even tried the product yet! It’s somewhat subjective, I suppose. But in my well-educated (24 years of full time industry study and analysis), professional, expert opinion… there’s just no way in hell any significant number of people are paying $99.95 for a Platinum Package for any other reason that to qualify for income by enrolling other IBOs with $99.95 Platinum Packages. Yes, yes, I remember a few pages up where I gave Platinum Packages only quadruple weight that results in a 42% CV-to-price ratio. Again, I was giving them the benefit of the doubt by assuming Platinum Packages sell at only four times the rate of most other WUN products. Personally, I believe, based on all the circumstantial and anecdotal evidence I’ve seen, Platinum Packages and Thunder sell at more like six to eight times the sales of the rest of the line combined. Yes, that will raise the CV ratio – and the right eyebrow of state and federal regulators. WUN recently published the aforementioned press release claiming to have amassed “over 100,000 customers.” That’s impressive. Or, is it? Is this 100,000 current customers? How is WUN defining customers in this count? Does this include D1s and D2s who have enrolled others, but haven’t completed IBO enrollment yet? If someone enrolls as a free customer, how long are they counted before their inactivity drops them from the count? I’m not suggesting WUN doesn’t have good answers to these questions, but rather, there’s no way of knowing if this 100,000 customer figure is impressive without knowing the answers to these questions. I asked, they didn’t answer. If (emphasis on the IF) they are counting all those who simply sign up for free, regardless of what they do after that, and those who have enrolled one or two others (D1s and D2s) but haven’t filled out the IBO Agreement yet, as “customers” then this not only is not at all impressive, but completely betrays their claim that they don’t “play games” with their customer numbers. And these people are defined as customers elsewhere. There’s also plenty more evidence that WUN is all about enrolling IBOs with Platinum Packages (or four 24-packs of Thunder, sign unseen and taste untasted). During the online enrollment process, after entering your name and email address, you are brought to a screen with the prominent notice, “Your next step is to earn 90 volume and get qualified.” That next step displays the three packages, with Platinum above and in the middle of the other two, with a gold “Recommended” banner draped over the corner (not one word about Thunder). It also just happens to be exactly 90 CV. The little instruction video that accompanies each step (which is otherwise a cool idea) is 42 seconds long. Thirty-two is spent talking the applicant into buying the Platinum Package, and the last 10 seconds are spent trying to talk them out of buying the Silver and Gold packages. WUN makes no distinction between Preferred Customers and IBOs. When anyone enrolls (which is free) they all start out as Preferred Customers. If they choose, they can become an IBO by completing the IBO Agreement and agreeing to the P&Ps. However, all those who enroll go into their sponsors downline, can immediately begin recruiting (even though they won’t get paid until they upgrade to IBO), and immediately have full access to a back office suite of business building and downline/sales volume tracking functions.101) Within their P&Ps, section 12.8 states: “The WakeUpNow Hub gives IBOs and customers access to online products as well as important information to help build their businesses. IBOs will be able to access their TeamOffice within the Hub.” (emphasis added) Why would a Preferred Customer, or anyone whose motive to join is just to get access to the product, want “important information to help build their businesses?” It’s almost as if WUN is acknowledging that no one is joining just to get the products. The WUN mantra is “B3H3G3 – Bring 3… Help 3… Get 3…” Not three customers, but get three who will then bring in three and help them get their three. Why would customers, who have no interest in the business and only want the products, need help getting three? Again, the emphasis is entirely on recruiting. “An IBO may also voluntarily cancel his or her IBO Agreement by failing to renew the Agreement on its anniversary date or by failing to pay his / her monthly website fee.”102 On the IBO enrollment form, and only on this form, it reveals that the cost for a Platinum Package is actually $89.95, plus a required $10.00 for an “IBO Marketing Suite,” which includes a replicated website and an “IBO Back-Office to help you build your business.”103 This begs the question, why is it still $99.95 for Preferred Customers? Yet, the GV of each of the first five ranks are all precisely divisible by 90 – the commissionable value of a Platinum Package. This should all say, attract customers… grow the company’s customer base… increase the number of our customers… generate interest in our products… retain existing customers and attract new customers. However, WUN clearly knows which side of their bread is buttered – and they’re not buttering up their customers. BECAUSE trends show we are excelling in that area. I can’t speak for WUN affiliates, but this objective, third-party analyst doesn’t see any emphasis on retailing at all. And unlike other WUN critics, I really wanted to find it! COMPANY: WUN appears to be in very poor financial condition, but their growth does appear to be in momentum. However, this momentum began back in early 2013, and I see little evidence of an expansion of infrastructure at a level that would account for their record net losses during this record revenue year. It is my opinion that these losses are mainly due to excessive overhead, primarily as a result of an over-paying compensation plan. And their expansion into South America is baffling. On the positive side, they are expanding into Asian countries, and expanding their product line into more conventional, tangible products. They appear to have great, in house, customer service – once you reach them (they do need to pipe in some classical music during the long waits on hold). Although BBB complaints are higher than average, they have promptly and positively address all of them, which is what counts most. But those bright red net losses really need to turn black, soon. PRODUCTS: Their energy drink product appears to be based on little more than carbonated water, flavoring, and caffeine, and their limited personal care line appears to be a fringe addition that is barely recognized. The rest of the line appears to be a collection of online products that are either free, or can be purchased for the same price, to in some cases occasionally for less, directly from the original provider, and the product “discounts” and “deals” are only true for those who can’t find the “Shopping” menu option on any Google search page. Their flagship product is a collection of these online products called the Platinum Package sold for $99.95. Its component parts are, in my judgment, of lesser value. Invisus, TaxBot, Transparent Language and their finance product are all excellent products unto themselves. You just don’t need WUN to access them. COMPENSATION PLAN: The WUN compensation plan is its one redeeming aspect. Relatively speaking. It pays literally nothing until a participant enrolls three people, no matter what group volume is generated under the first two, and hierarchical requirements make the higher ranks exceptionally harder to achieve, including those ranks that are most likely to produce a comfortable living income. The plan is also ripe for manipulation and abuse by clever participants, and includes an essentially meaningless “Customer” requirement that will do little to quench a regulator’s thirst for outside, “non-participant” customers. However, it’s one of the best plans I’ve ever seen for those who are looking for only a supplemental income of a few hundred dollars per month. All other issues aside, $600 a month for a downline of a dozen people each placing a $99.95 order is extremely attractive. POLICIES & PROCEDURES: I love their compliance policies regarding income claims, and their policy of not terminating IBOs who ask for a refund is uniquely distributor friendly. But, their refund policy is atrocious, and their claw back policy is worse. Their six month, 300 CV quota is entirely unique to WUN, and hopefully never actually enforced – because it’s ridiculous. There are a number of other policies unfriendly to reps that are adopted from standard industry P&Ps. LEGAL CONCERNS: Having good compliance training and an Income Disclosure Statement are strong plusses. Getting your reps to actually use them is another matter. However, graded on a curve (otherwise most MLMs would fail this one) WUN reps deserve a B-minus. They’re a long way from “excellent” (who isn’t? ), but after about three hours of doing nothing but watching and reading dozens of their pitches they are definitely better than most. However, their aggressive raiding of other MLM organizations (and there’s a lot more than one company that’s seriously pissed off about this) is probably going to get ugly if WUN doesn’t reign them in. It’s unlikely the unusual trading patterns are due to a Pump & Dump scheme, but this kind of quirky activity can get the attention of the SEC. If so, they may find that what WUN management is telling shareholders (current and potential) and their IBOs regarding their financials, present and future, are not consistent, and in some cases contradictory. I’m giving little weight to the state registration issue, or the high number of BBB complaints, but the bogus FTC email is also serious. Not so much for the email itself, which never really went viral and is finally being addressed by corporate (or, so I’ve heard), but more because WUN is no longer just a face in a crowd of over 1,000 MLMs to the FTC. It shined a spotlight on them, and the FTC is now paying attention. The FTC is the opposite of a Cheers bar. It’s where you absolutely do not want them to know your name. And now, they might see the same thing I see, which is lip service to customer acquisition and an overwhelming emphasis on recruiting, and on buying in with Platinum Packages – a product that, in my judgment, has little intrinsic value and virtually no market outside of qualifying IBOs. WUN desperately needs to expand the product line into more tangible, proprietary products, and phase out, or at least deemphasize, their eclectic product potpourri called Silver, Gold and Platinum Packages. This is the first review I’ve ever written that made me uncomfortable. Although I’ve been paid by companies to do private reviews of themselves, it’s also the first one I’ve ever been paid to write by others not associated with the subject of the review. This is really a no-win situation for me. No matter how well I make my case, or how much supporting evidence I provide to defend my point or opinion, if it’s at all critical of Wake Up Now, it will be perceived by many as gratuitous, or at least not objective. And, of course, that’s how WUN will spin it. That’s why I’ve applied extra effort to include verification, and some legal, mathematical or historical background to explain the concepts or theories behind my conclusions – and why I tried so hard to get them to discuss those conclusions with me. If anyone feels compelled to attack those conclusions, or me personally, on this basis, then allow me to make it easy for you. Let’s assume I am biased. I’ve written an obligatorily negative review of WUN to appease my clients. I’ve sold my honor, trust and credibility that I’ve built up over 24 years for less than I typically earn from one expert witness gig. I’m guilty. I’m a slime ball. Now, why am I wrong? I’m not at all suggesting I’m not, at least in some technical aspects of their financials, products or comp plan. There’s always the risk of not having my facts 100% straight when the subject of my research refuses to assist me in that effort – who then inevitably accuses me of “not getting his facts straight” once the review is published. In fact, I have two pages of questions I’d very much like to ask them, and one of those pages I did send to WUN president Jason Elrod. These were the simpler, one or two sentence answer type of questions. I received no response. In fact, when WUN was first made aware that I had begun this review I received an invitation from Mr. Elrod to visit their home office and they seemed more than willing to answer my questions and address any concerns. This was very early in the process and I had not yet compiled any questions or concerns, so asked that we speak by phone in a week or two. As a matter of course, I usually decline home office visits (even when all expenses are paid). I can’t afford the time away from the office, and I don’t want to be influenced by emotional attachments. I want my reviews to be pragmatic, fact based, and my opinions to be based purely on reason. And for the last ten days I have made every effort to have that conversation, and WUN management has declined. I have had review subjects who welcome my grilling, and come into the process confident they can address any concern I may have. They were never “too busy” to participate, and were loath to allow the review to be written without their side of the story being told. However, besides two very helpful links from their VP of Sales Andy Benis (thank you, Andy), and a limited email exchange from their consultant Troy Dooly (thank you, Troy) the only other response I have received from WUN, besides declining to speak via an intermediary, is a letter from their attorney accusing me of lying about my intent of objectivity, lecturing me on how to write a disclosure, and threatening possible legal action. I am aware of the First Amendment, and what’s called a SLAPP suit, so I have no concerns regarding the opinions and conclusions I have stated, and I stand by them. There has now. I just wish WUN had chosen to participate in it.